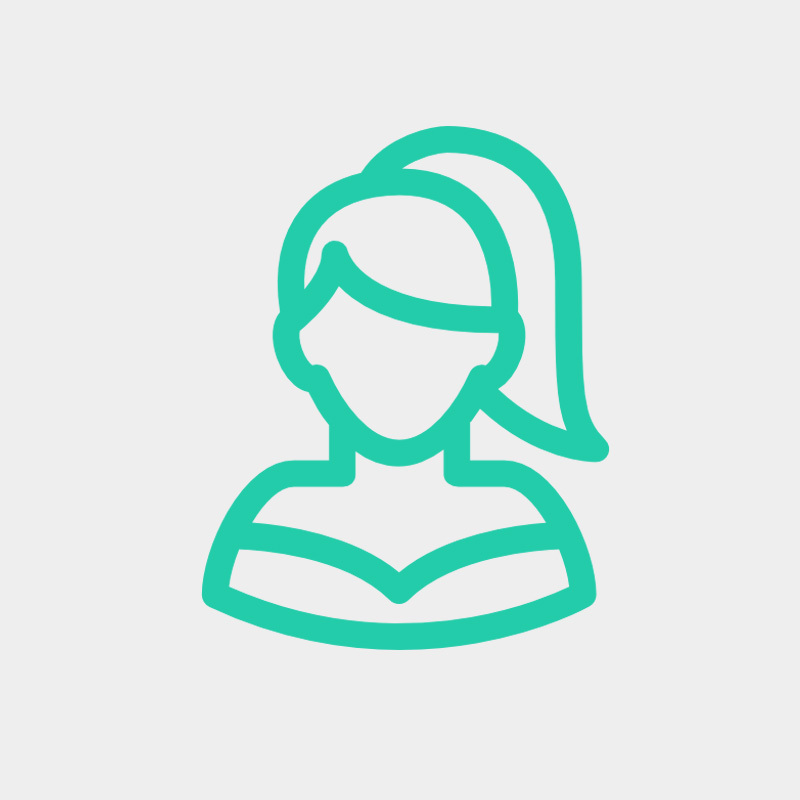 What is SOS? Detoxify. Degreasing. Tidy Out. This Is What Winners Look Like! 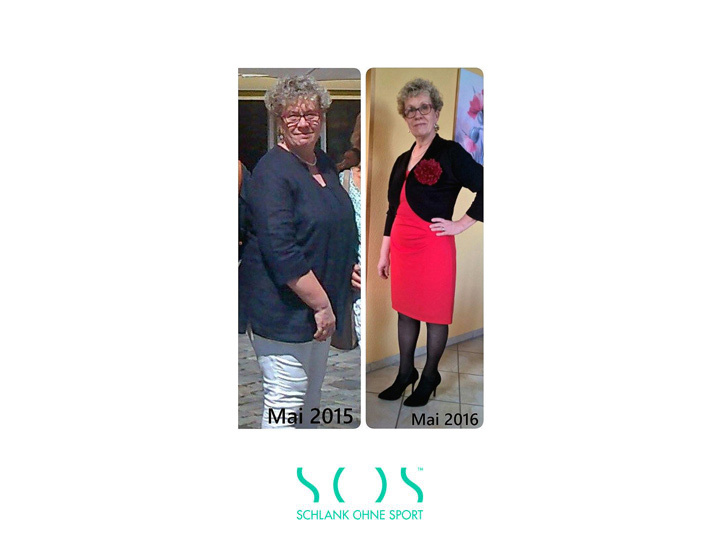 Change your diet to »SOS - Exercise-Schmxercise« and the unloved yo-yo effect is a thing of the past. Knowledge of the day: I have been a Montessori teacher for many years in Germany. In this pedagogy, we have learned to teach children all the steps of our daily activities - true to the motto: "Help me to do it myself." It's about showing things consciously so that the little ones can orient themselves in the adult world. So far so good. In my everyday life, however, everything has to be fast, quick, jagged. A lifestyle that's not any good. But we know that - time? is always too short! 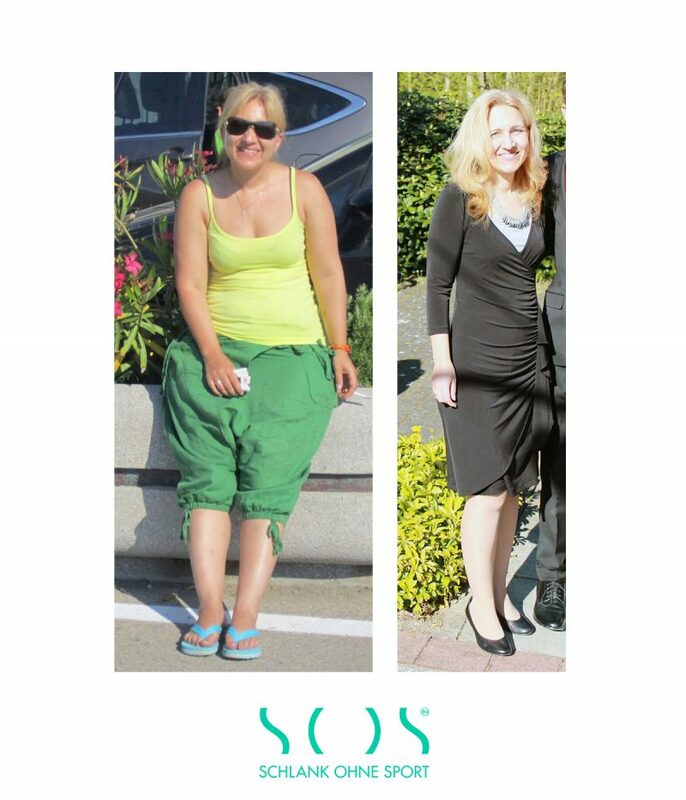 For 8 weeks now I devote myself intensively to the SOS nutrition. Apart from that, now I have two nice little kitchen gadgets (juicers und blender), it's a wonderful new life. By the way, now I've learned how meditative it can be to cut vegetables. (Day 7 Note: beets and carrots make unfortunate spots on clothes). My everyday life often ends up in an intimate kneading of the chia bread dough or after filling my new grains in a glass pot. I'm already DECELERATED! I deal with my food and myself much more consciously. SOS is so much more than just ANOTHER OTHER MEAL. 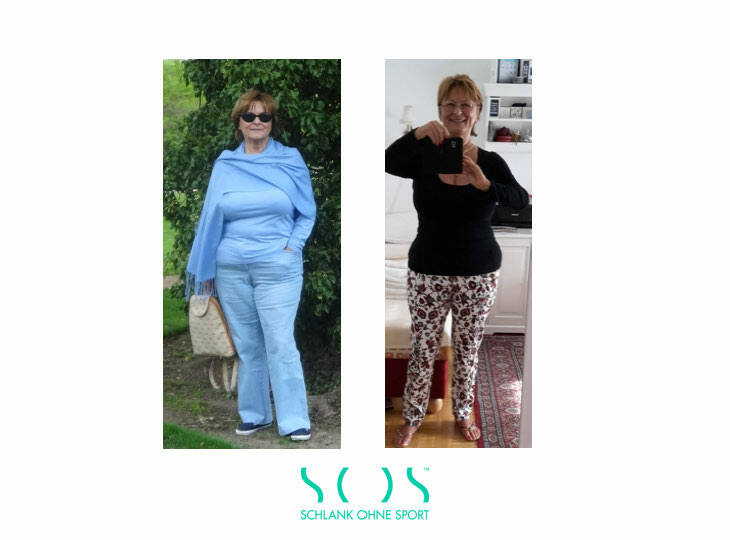 Claudia Breder, January 2018 - update: Down from 133,6 kg to 73,6: I lost 60 kg in less than a year with SOS!!! 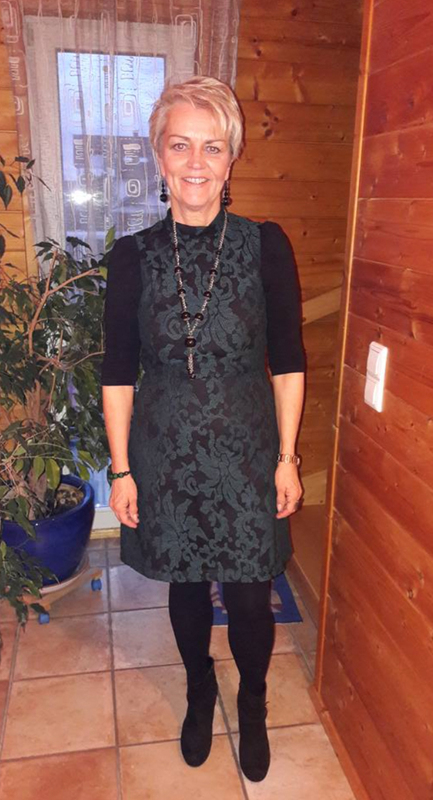 December 2017: Great result - my scales say 77,6 kg. For the first time! I managed to sustain the 78 kg mark I had reached by mid-September, and today I’m at 77,6 kg. Despite a few ups and downs - once at 83 kg - I had no problem getting back on track fast. 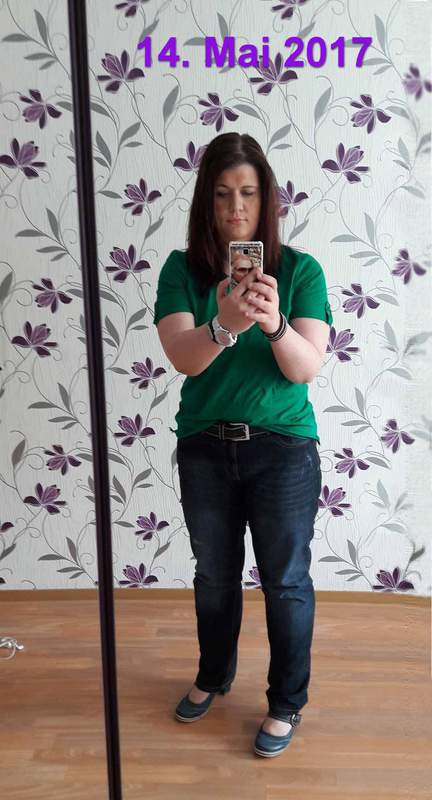 As of today, I lost 56 kg! 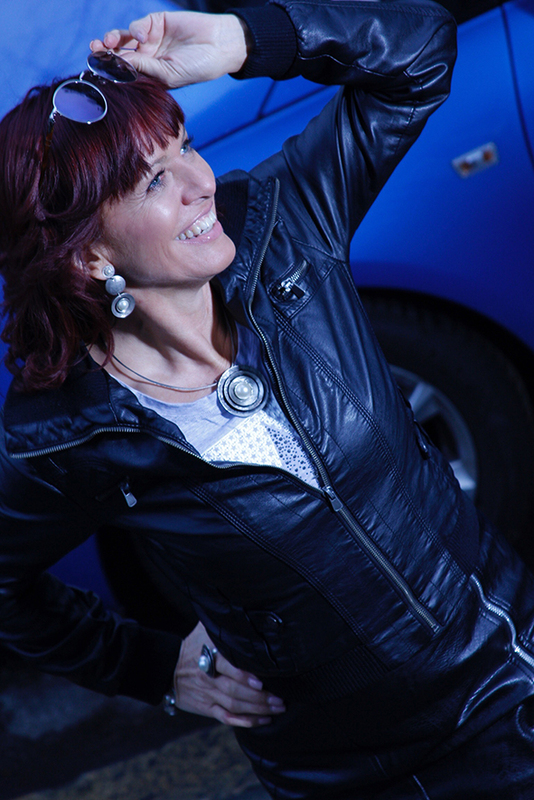 Very special eternal thanks to you, Katharina, for this wonderful programme. I will stick with it for the rest of my life an know I will be fine. Especially my overall health has improved by 90%. I have gained a completely new life thanks to SOS! I just have to tell you this: I still can’t believe how far I got in such a short time!!! My life has changed completely. I have no words for the joy I feel. The photos show a difference of 5 months. 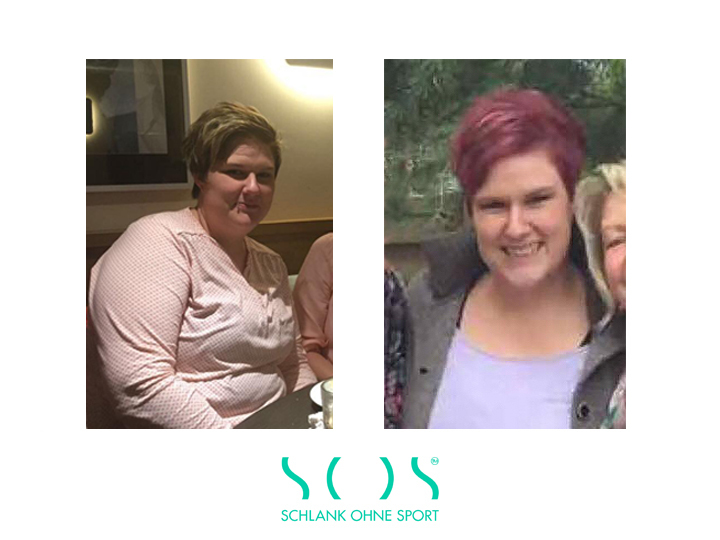 I started in April 2017 and now weigh 18 kg less! But my goal is to lose another 17 kg and am hoping to keep up my success. I love my new life and I love ME! Yay! for darling Katharina Bachman! The world was just waiting for you, you have made so many people happy. I could kiss your feet, wonderful woman. And she will be my hero for ever. Thank you for my new life! I just wanted to say thank you for everything the book and all the experience on your part have brought me. 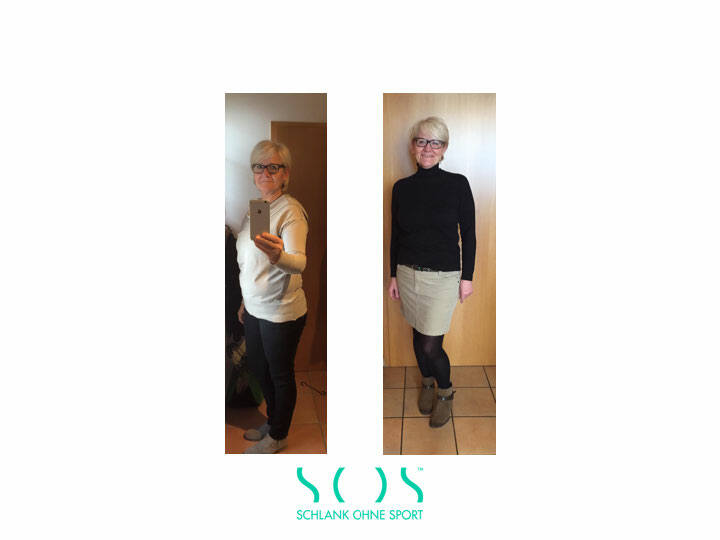 I lost 9 kilos in 10 weeks! 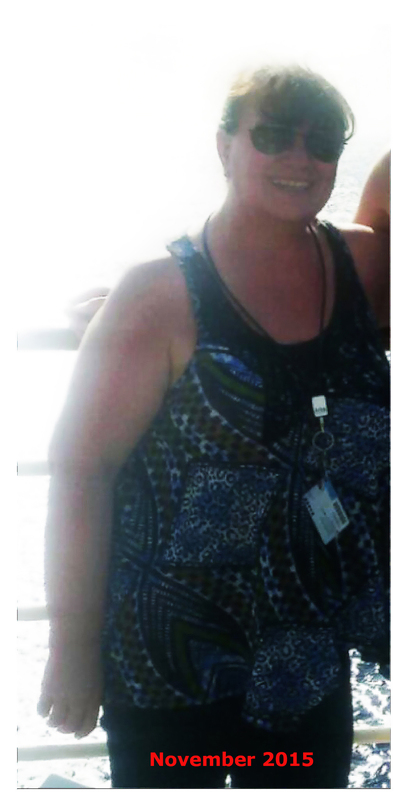 I am finally happy, love my body again, and can lose weight without starving and stress. I get compliments and get asked what I did to look this great. I am much more active, go out again, and spend more time with friends. I go to the beach and the swimming pool without any problems, and I am not ashamed anymore. 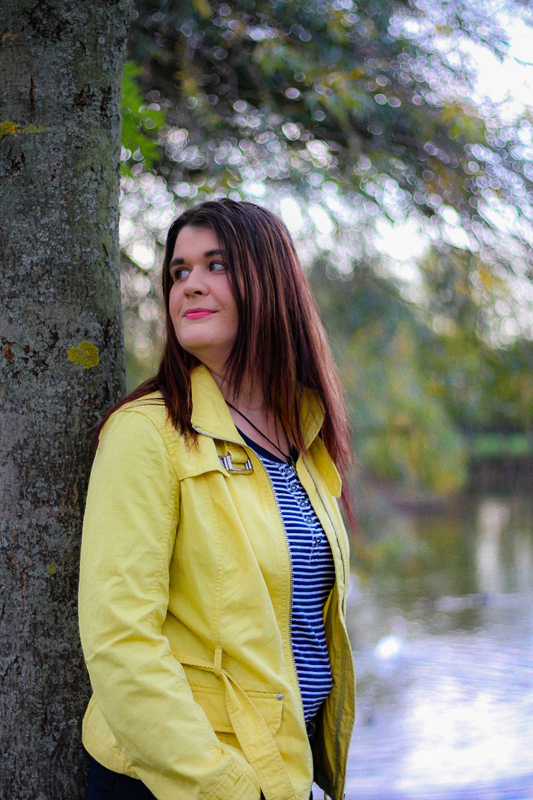 I am actually very self-confident, but I had lost that confidence in all my weight. I have a goal! I will continue to follow your concept and recommend it. I have told many of my customers about you because there are actual results, and I can be happy and don't have to follow a fast diet. I bow to you, you have given me a new life and a building block that brings many others with it. I never thought I'd be so determined. Thank you for writing this book and changing my life! I feel so much better, and even my bones, back, and joints, everything! I'm so happy! Today, on April 23rd, 2017, Facebook posted a photo of me at my heaviest. Ouch. 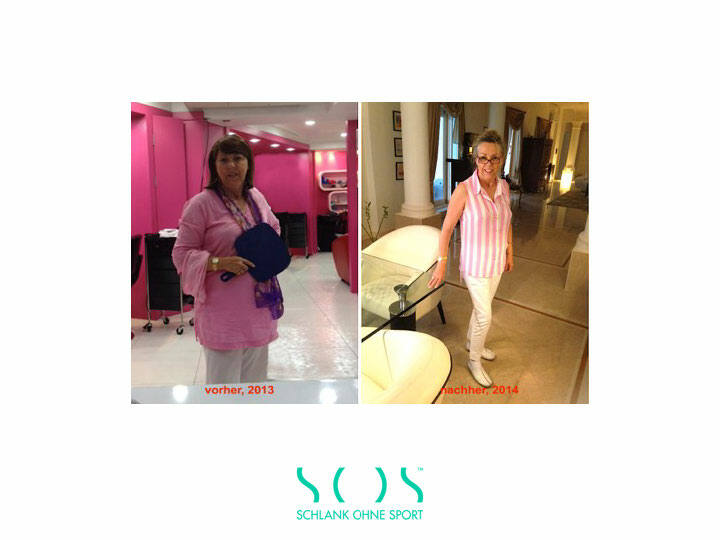 By June 2014, I had lost 5 kg thanks to SOS, after 2 weeks detox, the plan of which Katharina had sent me for testing. After a third detox week, another 5 kg evaporated right around the time the book was published in April 2015. Then I dropped another 9 kg, sustaining my weight until Christmas of 2016. 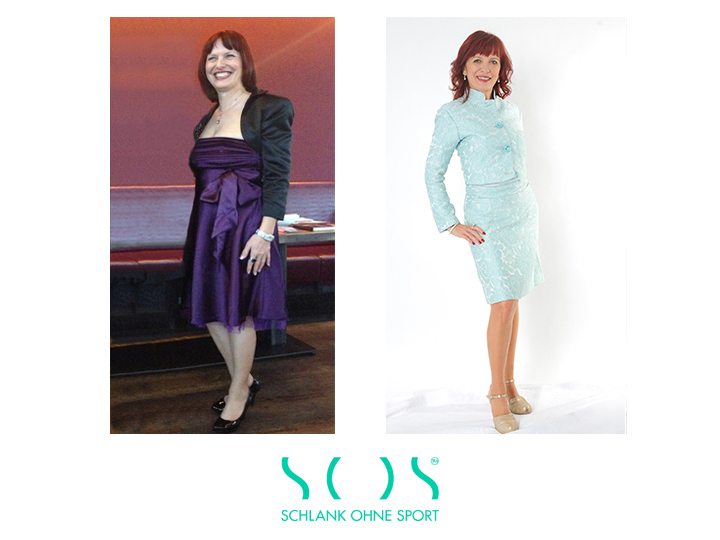 Currently, I weigh 52/53 kg at a height of 1,60 m.
I designed and had the turquoise outfit (photo in slider, on the right) especially tailored for my “new life”. My goodness! We just had a look at the pictures of our vacation last year, how shocking!!! 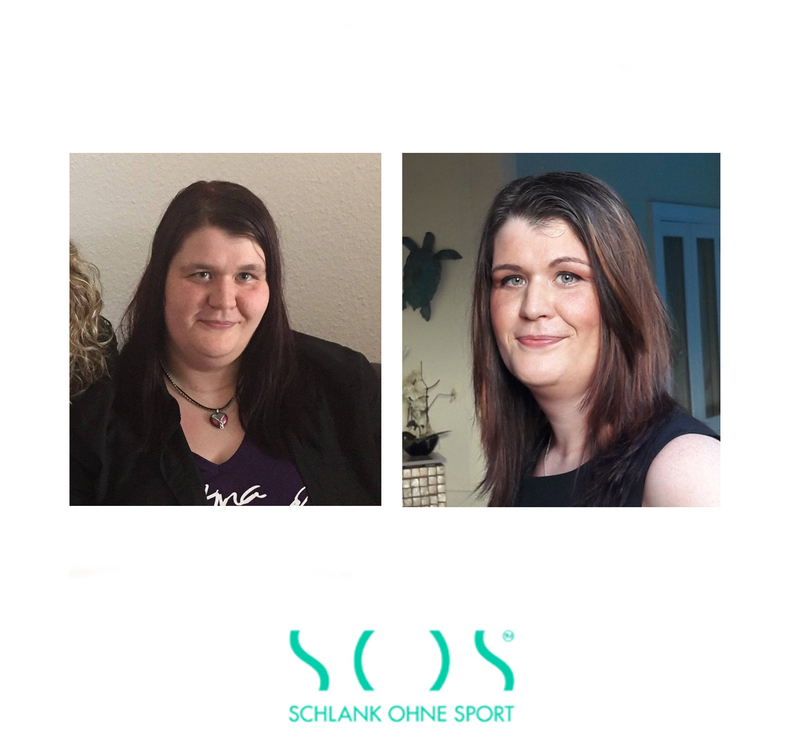 The difference in the before and after pics is 11 kg less. Your vacation was in August 2016 and my travel reading was: Katherina’s book. Having read it, I immediately started the first detox week. I would like to tell a different story here. 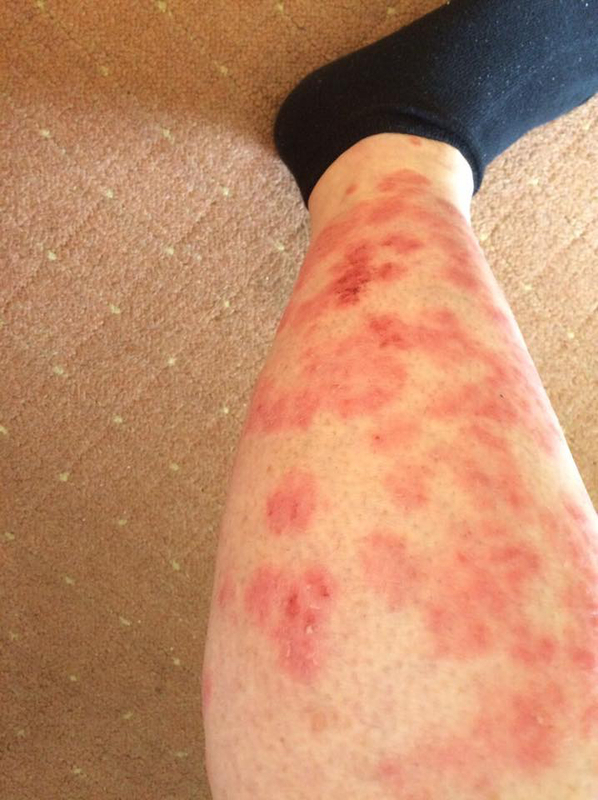 For 27 years, I suffered from psoriasis, during which time I tried so many different things, and also spent a lot of time in dermatology clinics. 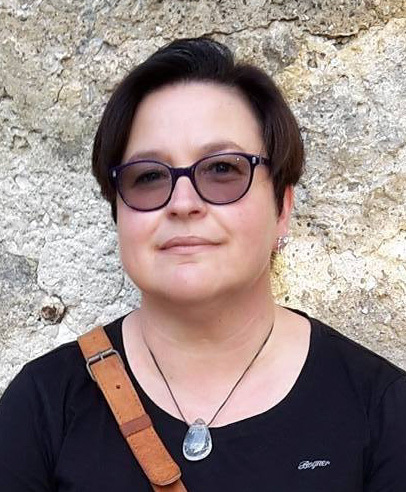 In connection with my condition, my friend Dominique Frohwein recommended Katharina’s book. And lo and behold…it worked! 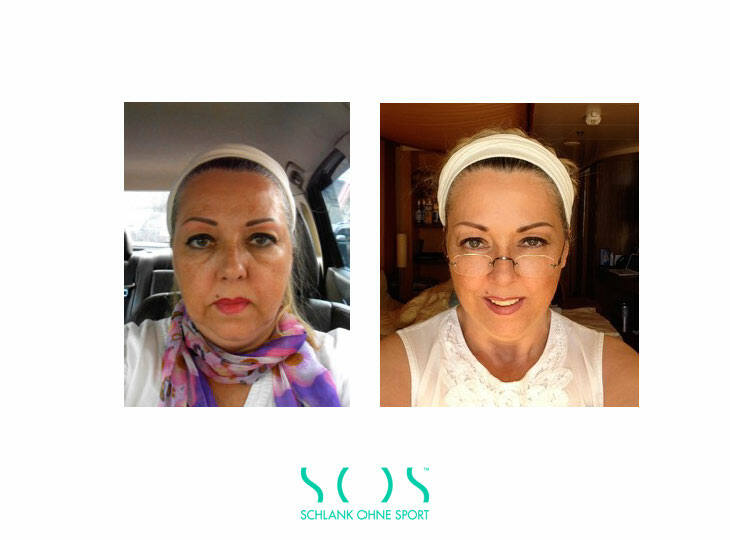 I started SOS 6 months ago and my skin and joints are truly grateful! 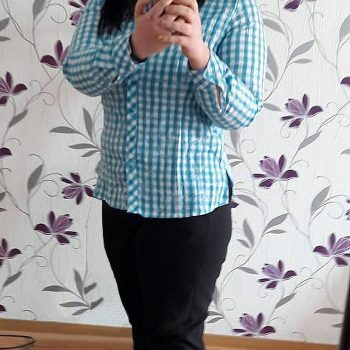 I also lost 8 kg during this time. The pain I could have spared myself, had I only know all this 27 years ago. I want to thank Katharina Bachman for this fantastic book, which can really make miracles happen, if you stick to the plan. 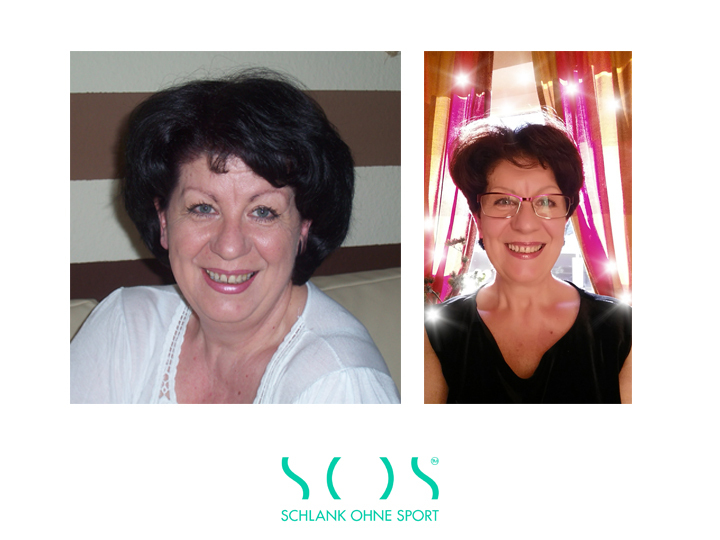 And of course, the great SOS group, for all your support, and for ALWAYS being there for me with greta tips and advice! You guys really rock. THANKS!!! P.S. : At the clinic, they were always blabbing about healthy food. But guess what was on the menu: Wheat! Dairy products! Sugar! MSG! Someone should really educate them! Such a shame that no one is really taking the time to look into this! Instead, they medicate you and treat you with cortisone, which only makes you more sick. It’s such a shame! 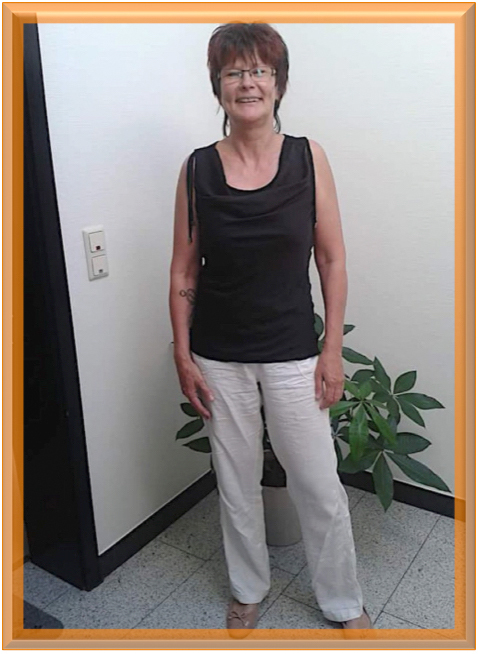 Oh, dear Katharina, how grateful I am to you for sharing all your knowledge and experiences with us. Thank you! Thank you very much! Please also tell your doctor thank you very much, he is not a miracle man, he is a doctor who precisely evaluates, knows and implements foods and their ingredients!!! I am so grateful to you right now, as you were undoubtedly thankful to him then, and still are today. You wrote in the book: it's no guarantee of a long life, we can drop dead tomorrow. But I know one thing, every day is worth living for! That's the new feeling of life I've never known before. 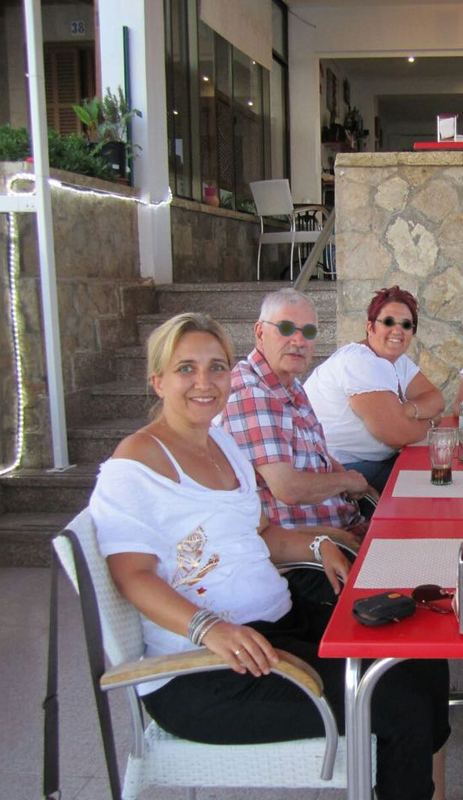 The first photo here on the right (white blouse with dark dots) shows me 2012. 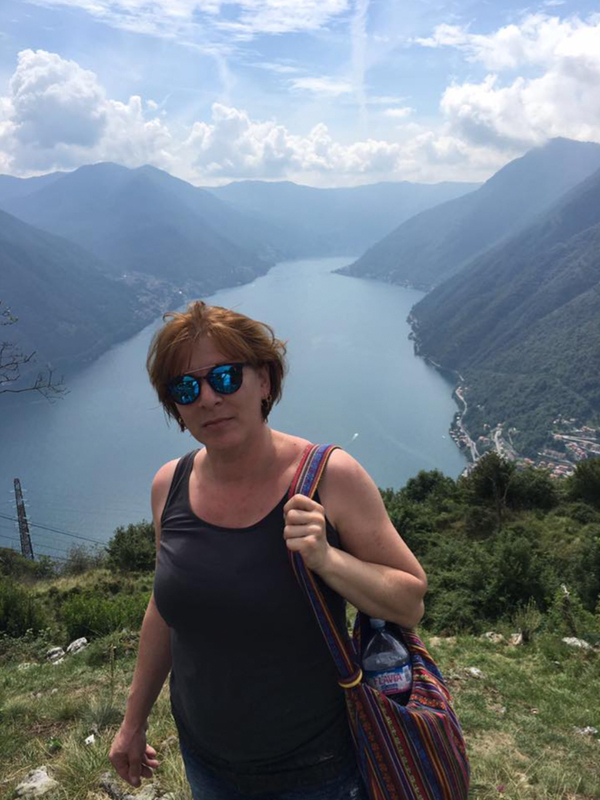 After many serious illnesses (depression, cancer, burn out, generalized anxiety disorder) between 2005 and 2010, I was at the end of my powers ... Continue reading here! 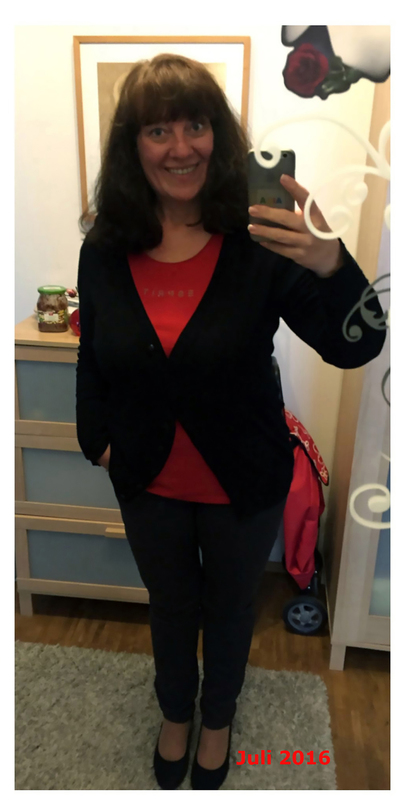 I’ve been at 59 kilos for the first time in about 10 years!!! 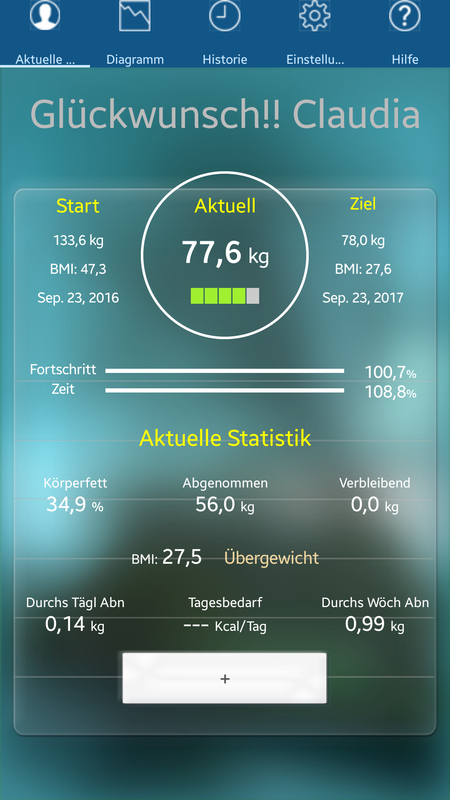 I started on 09/26/2016 with 71.4 kilos. 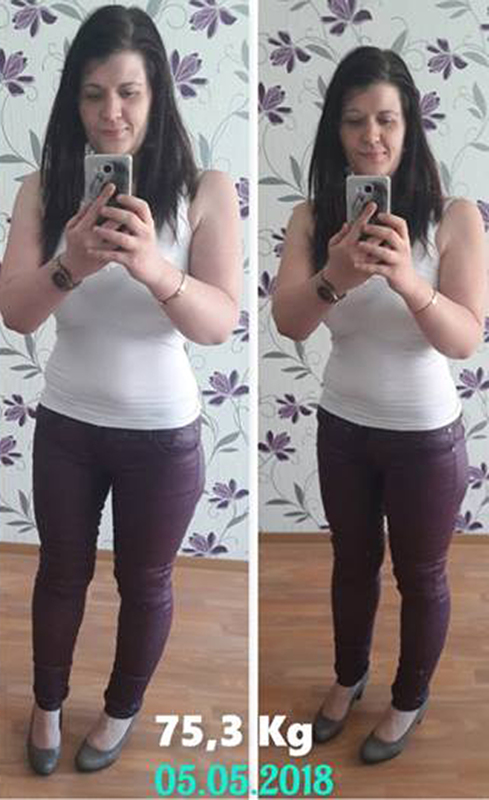 I had lost several kilos after 5 weeks of detoxification in a row. My goal was to lose 10 kilos. I did it with much joy. Such great ideas, recipes, suggestions... just great. Many thanks to all of you. Especially to you, dear Katharina. Your brilliant books have changed my life. Many thanks! 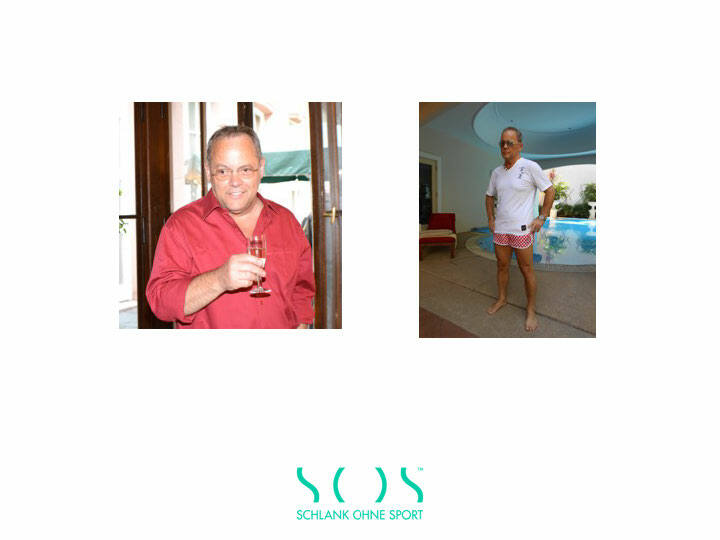 After slimming down with „SOS - Schlank ohne Sport," I hope for the same effect and success with your new book „SOS - Schön ohne Schummeln." I will continue to cook and live by the SOS rule. Just because I feel incredibly good about it. To all „newcomers” and „fast-breakers,” please hold on. It is worth it. If you need help, please ask for advice and support from the group. Have a nice Sunday. I'm happy in both pictures. I am a positive person who loves life and is grateful for what it is like. I love my life! 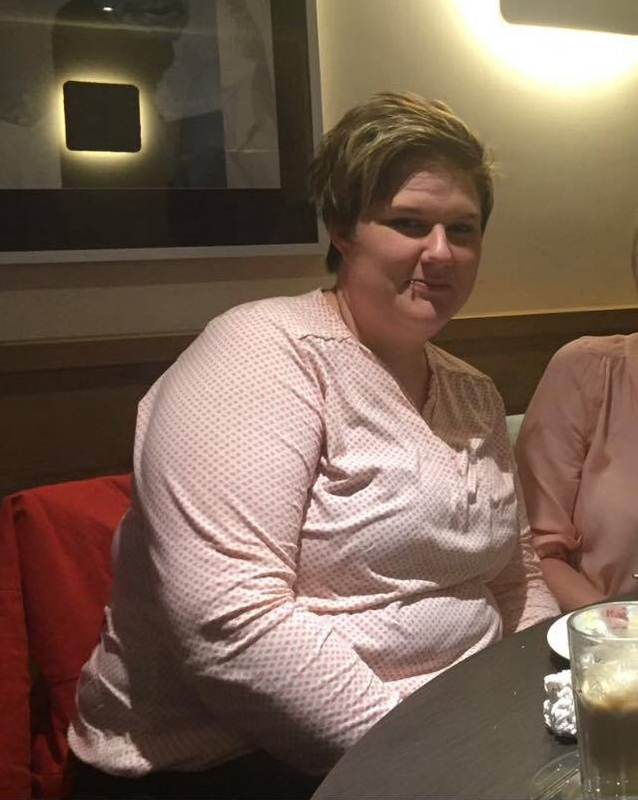 The picture (red shirt) was taken after the birth of my first child. I weighed 85 kilos! Since then I've dragged around a mass of kilos. 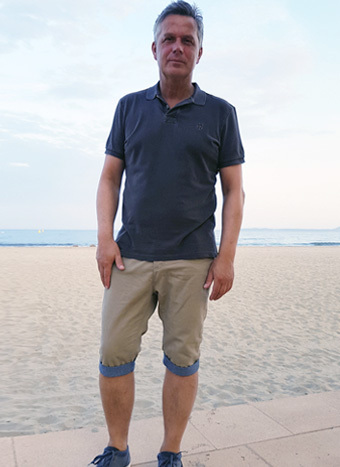 I was wearing clothing size 44, 46 and even 48 for 12 years, it always fluctuated back and forth, but never below size 42. 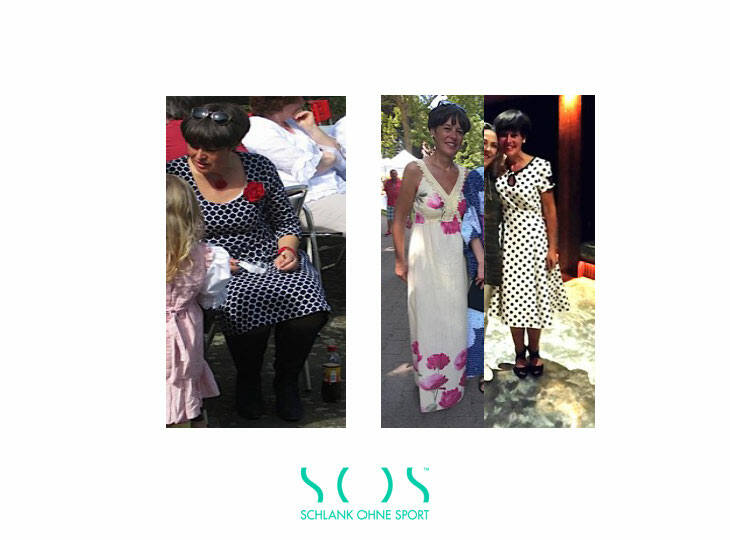 A few times I made it to size 42, then the weight loss stopped (although I was doing enough exercise!) and it didn't go down another gram, it actually went up again. I'm sure you know all about the yo-yo effect. Then I discovered SOS and started. 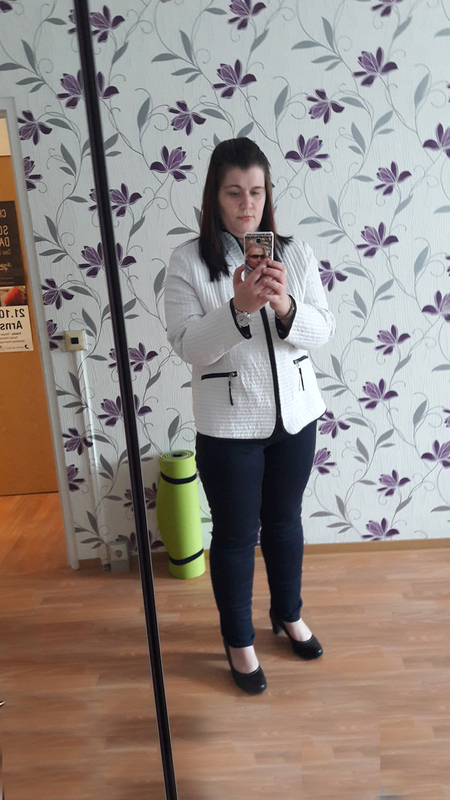 Today I wear size 36/38 again, I’m always full, and eat some sweets now and then. I don’t have to go without anything. I wanted to thank you for all the valuable tips from the SOS book and not to withhold the comments of the people I gave it to. It is always nice to receive positive feedback. About two years ago I got your book from one of my friends. I have read it several times, and also given it to some of my friends. "This is the best gift you have given me over the years ... I have lost 7 pounds. Since you left here, I haven't had any bread or cheese products. Yesterday was the last day of the bowel cleanse. I feel great, and I intend to continue to do so. The book is full of wisdom, and I am glad to have read it. I will do this again before we get there (because of the buns and the beloved German food)." 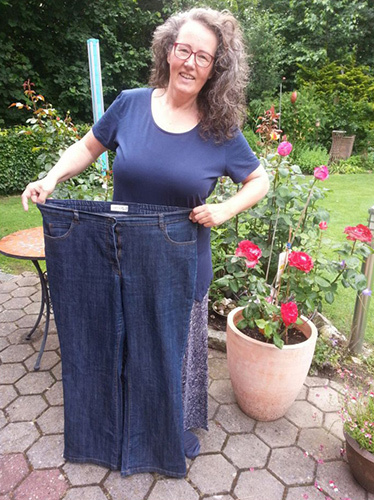 She lost a total of 25 pounds and reached her dream weight of 1978. She wrote me five times about how great the book is, and how easy this weight loss method is, and how grateful she is to me for the book. Well, that’s something, isn’t it? Of course, my partner and I also did the detoxification week. He did it three times in a row. For me, it’s more like a guide to healthy eating. I have incorporated a lot of your advice into our daily nutrition and tried out some of the recipes. Tasty! So, in this sense, thank you very much to you and the Doc, and we wish you much success with your books. 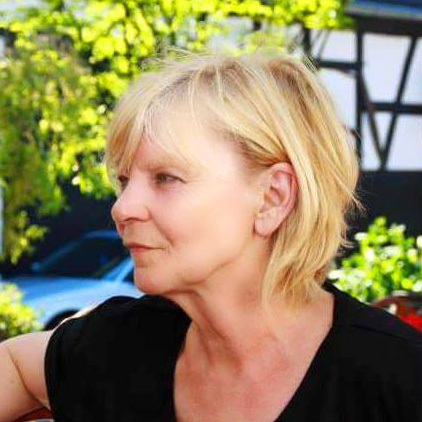 I have known Katharina Bachman since my school days. We were, as they say, best friends. When she visited her parents in Germany again, she came to see me. She looked fantastic, and the new attitude to life was literally visible. She enthusiastically told me about her detoxification and nutritional change and that she wrote a book about it. Excitement gripped me. I quickly ordered the book and held it in my hands on the day of publication. 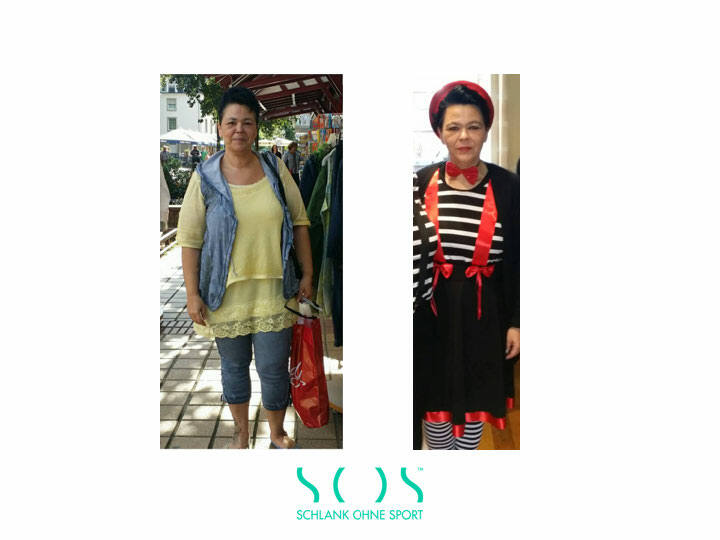 I lost 13 kg within 16 weeks due to the detoxification and change of diet. But the best thing about it is the new feeling of life and body, that my blood values are back to normal, my blood pressure is stable, and my thyroid gland medication has been reduced. I never starved on any day, and my craving for sweets was gone after day four of the detox. 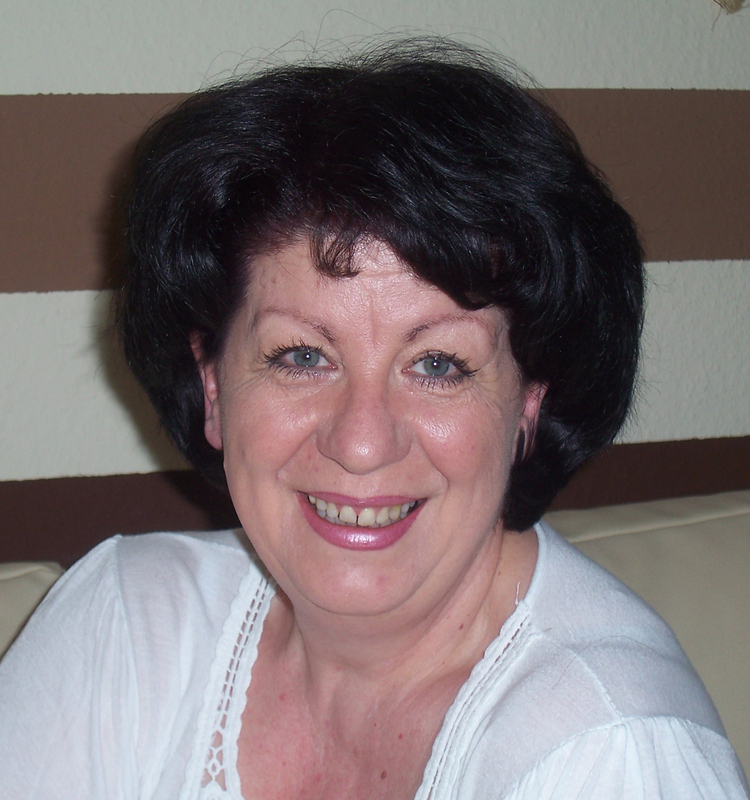 Dear Katharina, thank you for sharing your experiences in this book. I can only recommend the book. 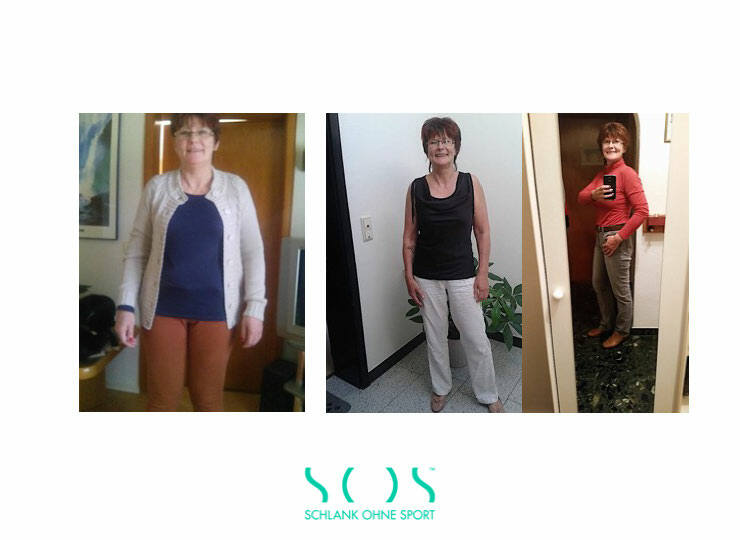 And you can get everything you need for detoxification and change of diet in Germany. Sometimes in life, we wonder why we do the things we do. The reasons for our actions are as different as our individualities. 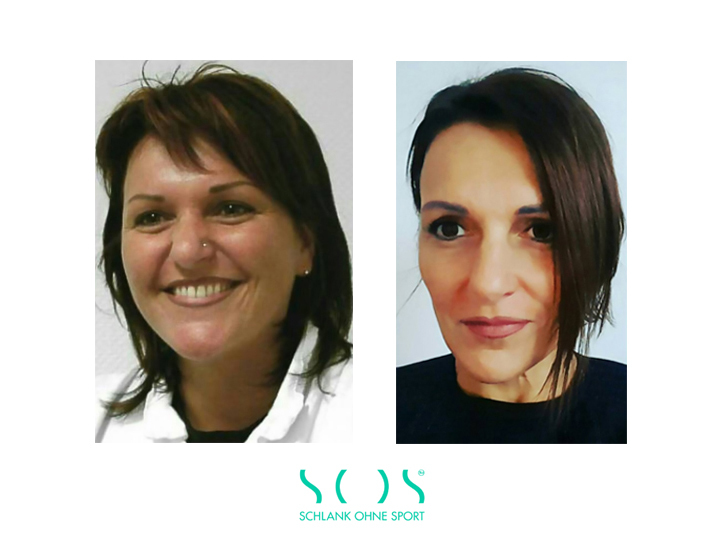 Today I would like to tell you why SOS has particular, additional value for me. When I got married again a year and a half ago, our "patchwork kids" gifted us two tandem parachute jumps. However, conditions for the jump were not more than 90 kg of body weight. 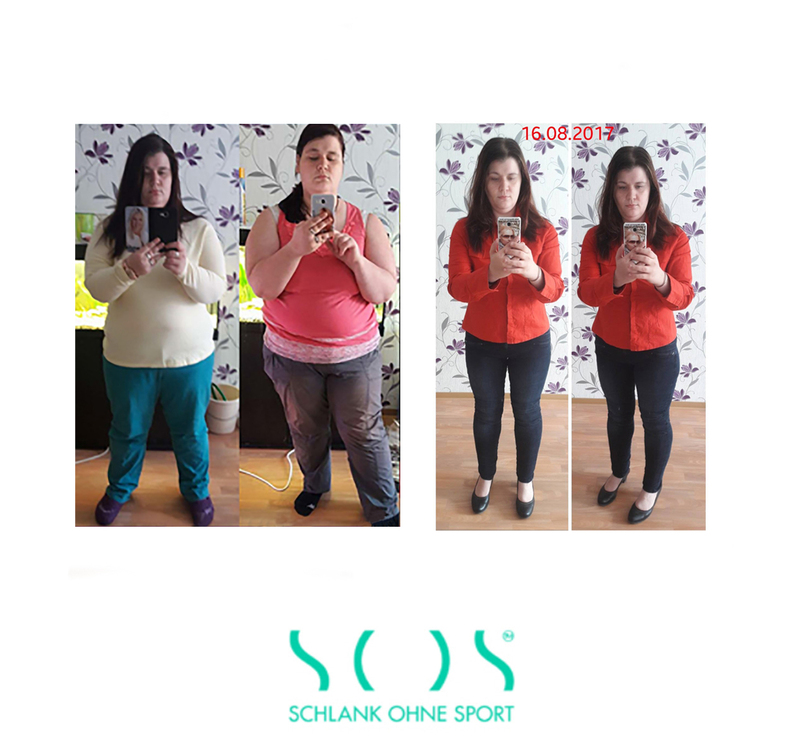 In February I still weighed at least 95 kg... Yes... 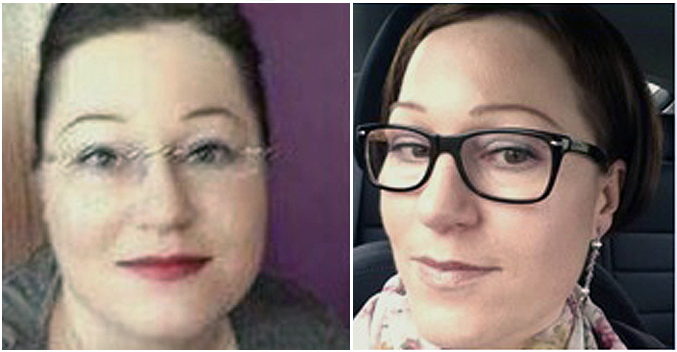 I starved 1.8 kilos off my weight and was … kind of desperate. 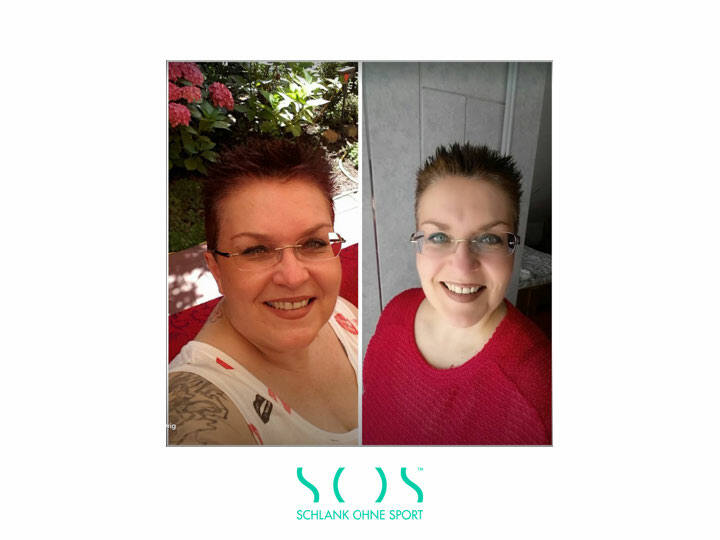 Thanks to Katharina's SOS turbo metabolic program, I was able to lose 3.2 kilograms during the detoxification week and was able to reach 90 kilograms, which I not only maintained but also undercut thanks to my change in diet. And then it finally happened today. We jumped from a height of 4.100 m height – and the best part was when they asked me about my weight… I was able to answer: 89 kilos! Therefore, whatever reasons are driving us to make it through SOS are the right ones. Good luck to everyone. I am losing weight very slowly, but "healthy". This is very important to me, because my skin is no longer as elastic as I was in my 30s. 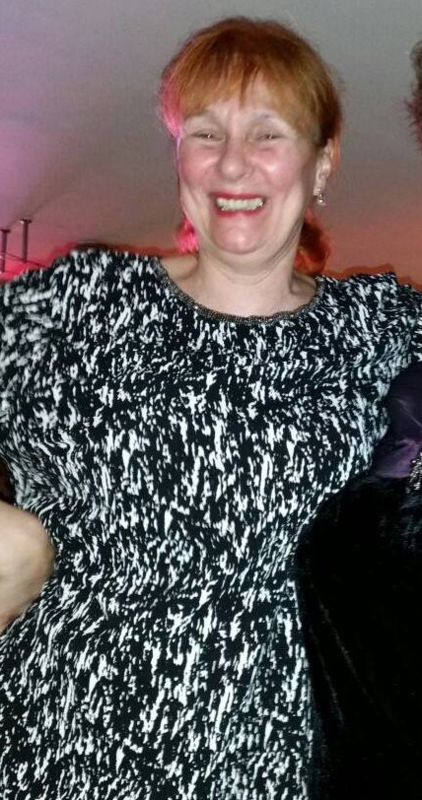 Due to a disease I was hardly able to move, and this at the end of the menopause. Besides, I managed to quit smoking. And then, as a person who enjoys eating, my cells were pretty much forced to switch to storage mode. I always had size 34/38, then the hot flushes and insomnia started, and I quickly had 38/40. Before my surgery last year, I had 40/42! 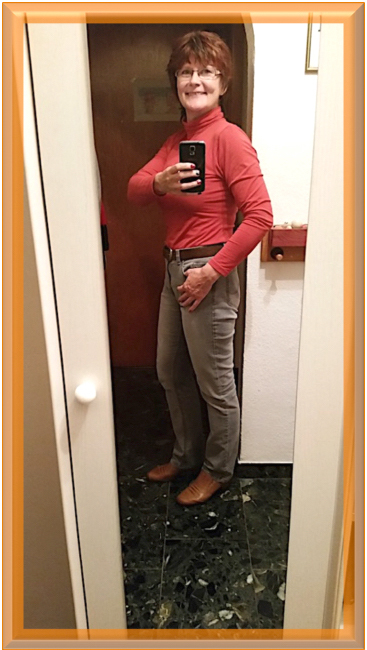 The impulse picture (before photo) with 82.3 kilograms on January 27,2016. 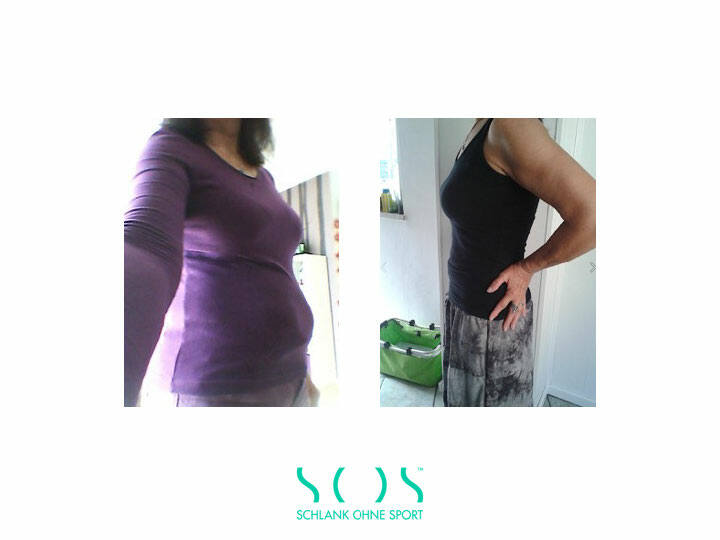 I lost 1.8 kg during the first week of the SOS detoxification. 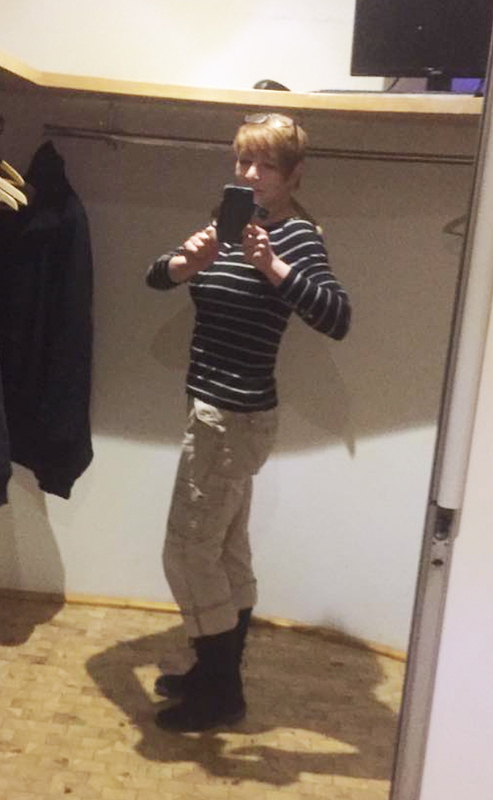 But my latest pants purchase (after photo) on August 20, 2016 with 70.3 kilos makes me happy!!! I quickly realized that I have to take responsibility for my own health and that I have to invest in my own health. 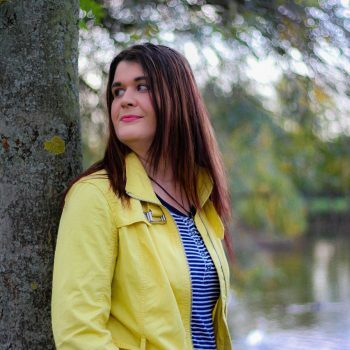 Catherine's book was the best thing that could have happened to me and it gave me back a piece of quality of life. I have »Myasthenia Gravis«, an autoimmune disease in which the immune system forms antibodies against my own body, specifically the receptors (between nerves and muscles) and attacks them. Using pills, my immune system was brought down to produce fewer antibodies, which is harmful to me. 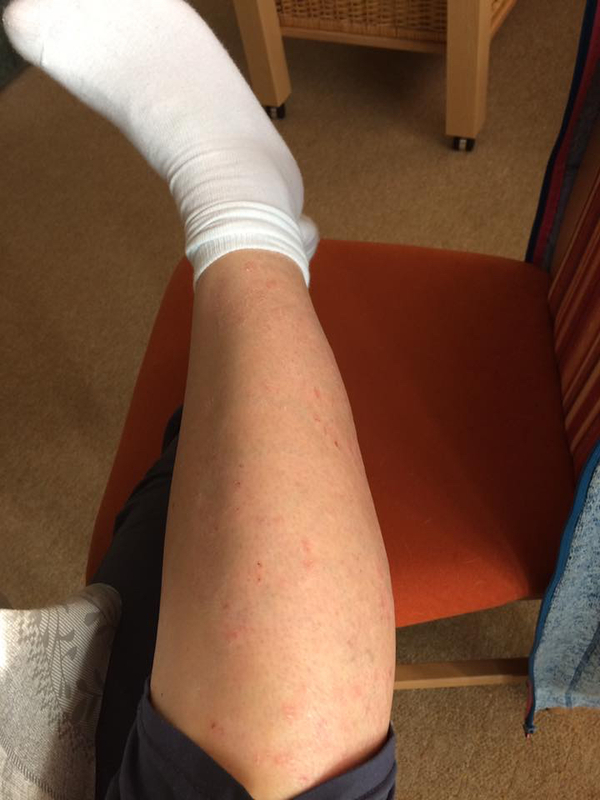 From the point of view of some doctors - and this is also written down in specialist books - I have to avoid everything that stimulates or strengthens my immune system. Citrus fruits are even forbidden. I am not able to change my diet at all, because I would take in far too many vitamins and enormously strengthen my immune system. According to orthodox medicine, this would mean that my antibodies would increase and thus naturally cause more damage. In reality, it was different. I followed the advice of orthodox medicine, but the antibodies in my blood have been increasing for months and no one had an explanation. So I dared to take the step of testing the SOS diet change, with monthly blood checks, of course. The result is great! My antibodies in the blood didn't increase, but rather decreased! I need 3 less medicines, have no stomach and intestinal problems, no migraines, no more heartburn, better skin and I quickly lost weight. 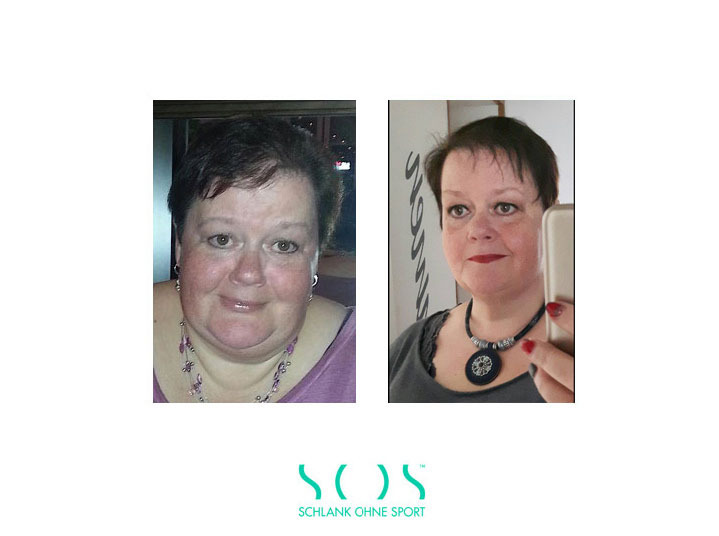 I am not cured of my illness, but I have regained a part of my quality of life through the SOS diet change and I am grateful for that. In Wirklichkeit war es anders. 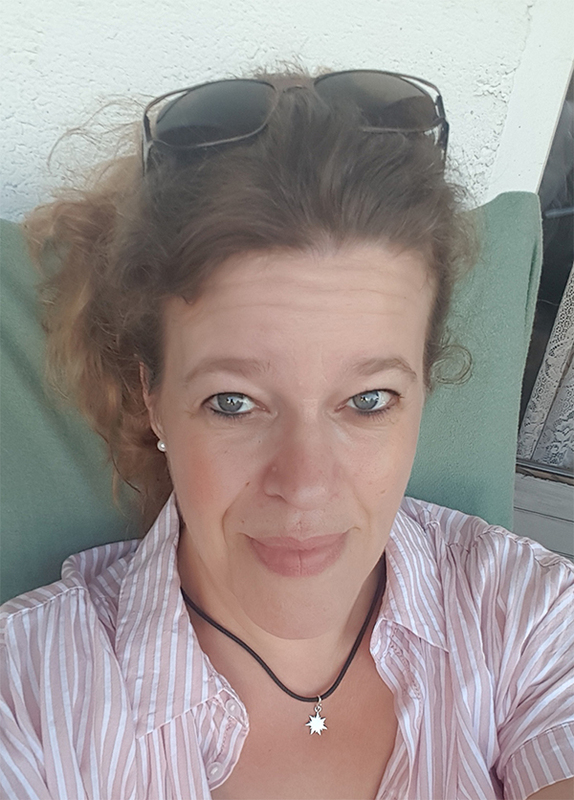 Ich befolgte den Rat der Schulmedizin, doch seit Monaten stiegen meine Antikörper im Blut an und niemand hatte eine Erklärung dafür. 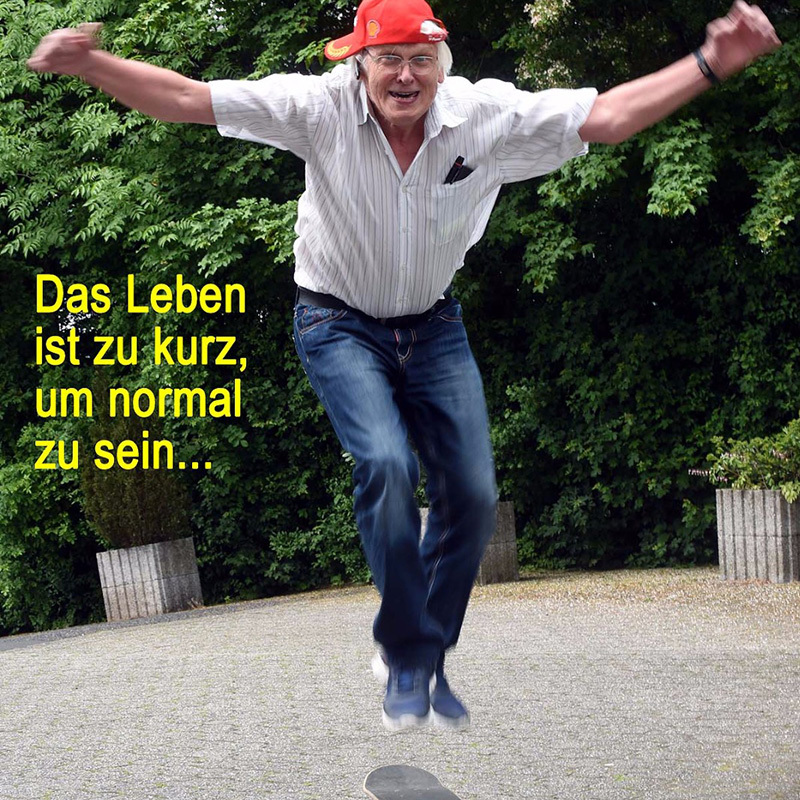 Ich wagte also den Schritt, die SOS-Ernährungsumstellung zu testen, aber natürlich mit monatlichen Blutkontrollen. Das Resultat ist großartig! Meine Antikörper im Blut sind nicht angestiegen sondern stark gesunken! 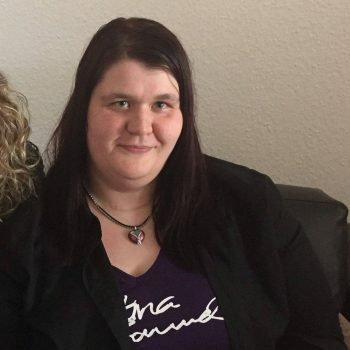 Ich benötige 3 Medikamente weniger, habe keine Magen- und Darmprobleme, keine Migräne, kein Sodbrennen mehr, bessere Haut bekommen und dazu habe ich auch noch schnell und viel abgenommen. Ich bin nicht geheilt von meiner Krankheit, aber ich habe durch die SOS-Ernährungsumstellung ein Stück Lebensqualität zurückbekommen und dafür bin ich dankbar. 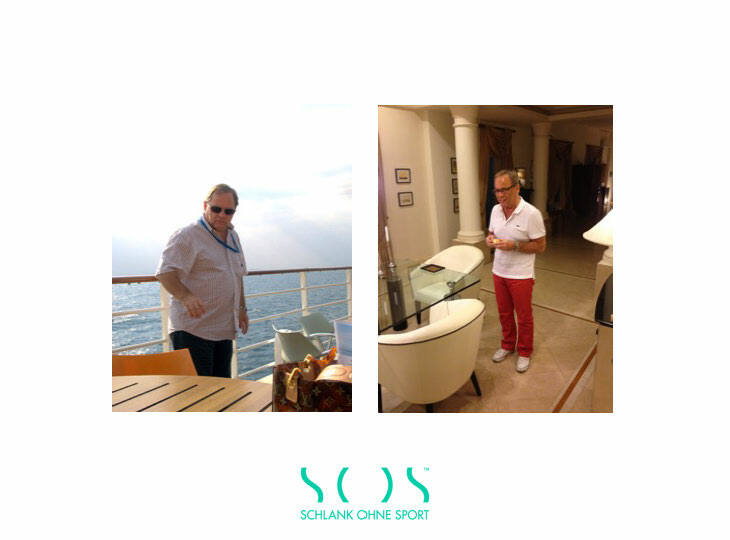 From 107 kilos down to 78 kilos thanks to SOS! 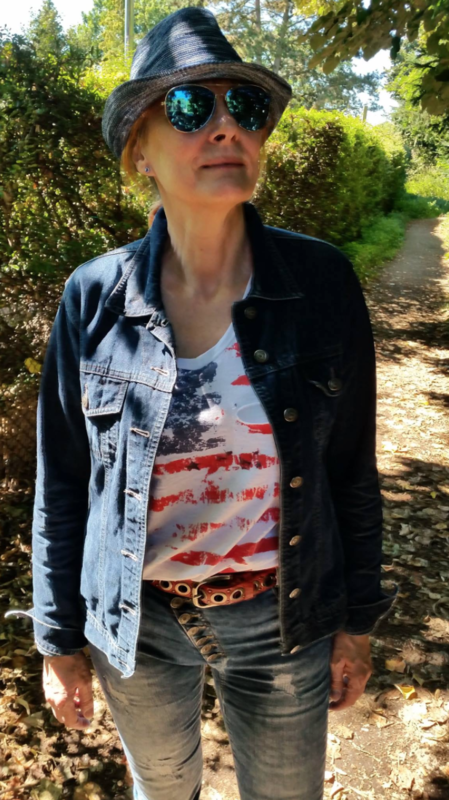 The trigger for my change of diet was a group photo, on which I almost didn’t recognize myself because I didn’t see myself that way. 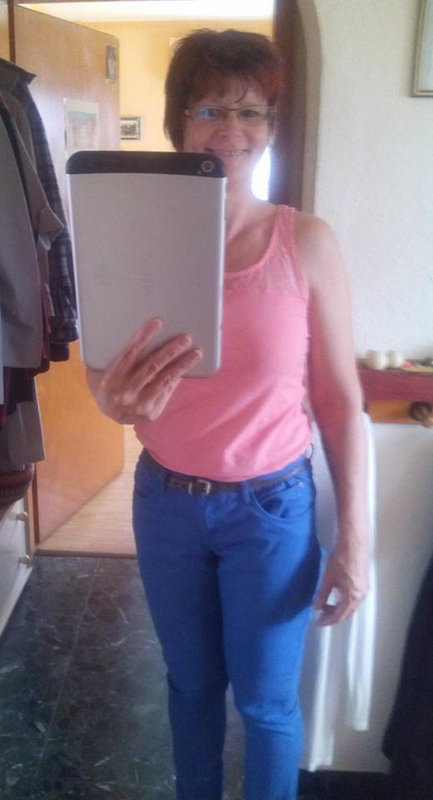 Selfies then confirmed that I am too big! A few days later I stepped on the scale and was shocked. At 171cm, I weighed 107 kilos! 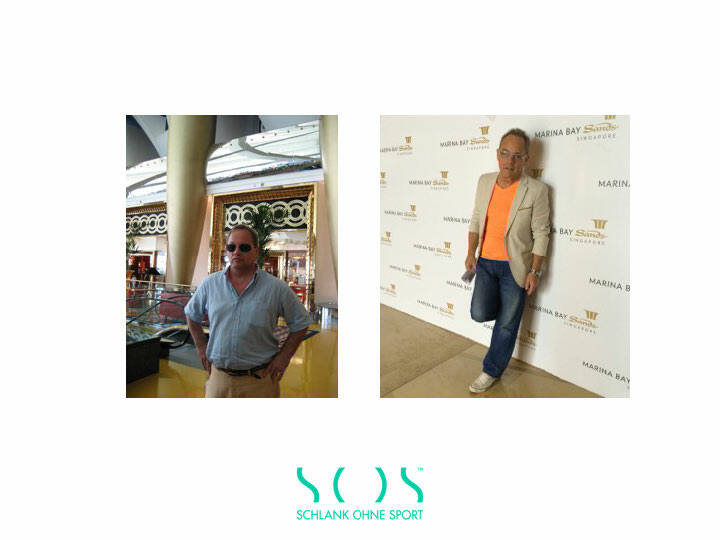 I became aware of »SOS - Schlank ohne Sport« and their concept, which was very convenient for me because I don’t like sports at all, except on television. I quickly ordered the book, and Papain capsules, and coconut oil. My foundation was created, and I started the adventure. I actually shed weight, sometimes more, sometimes less. 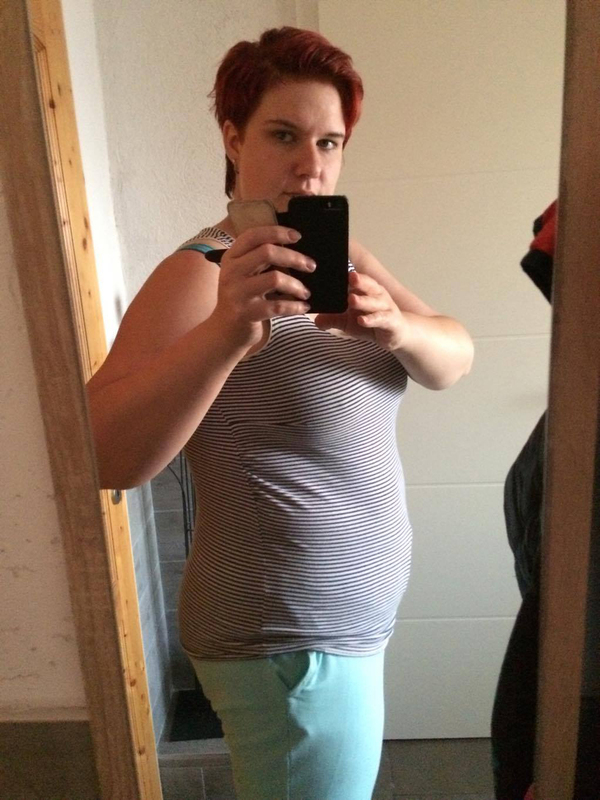 Sometimes I gained some weight again, but I never wanted to look like I did before. 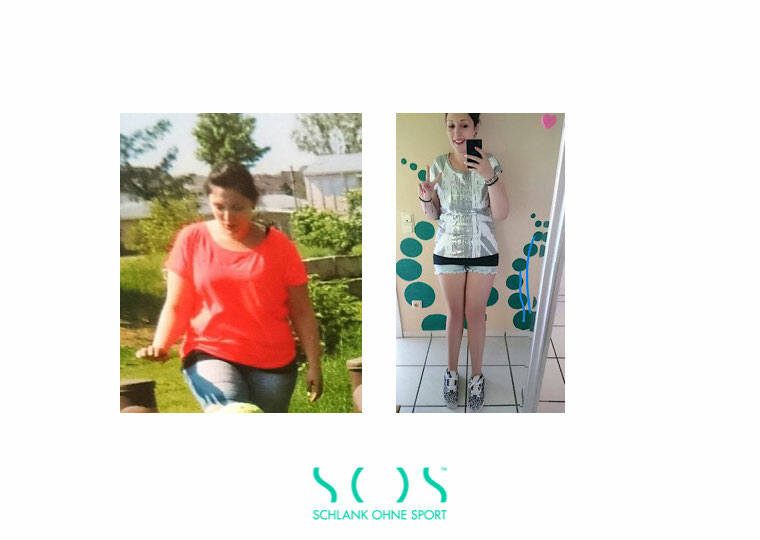 My goal was (and still is) 80 kilos, and not to see a higher number on the scale. I photographed my DOD adventure in the form of a diary and posted it in the SOS Facebook group. Since last week (as of June 2016) I weigh 78. 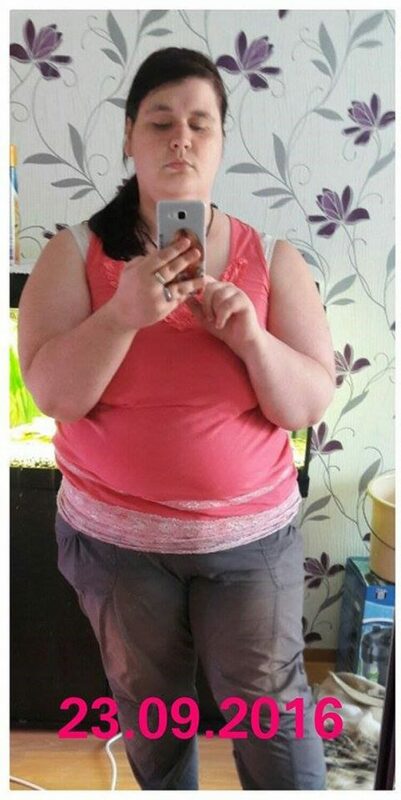 I have lost 30 kilos. 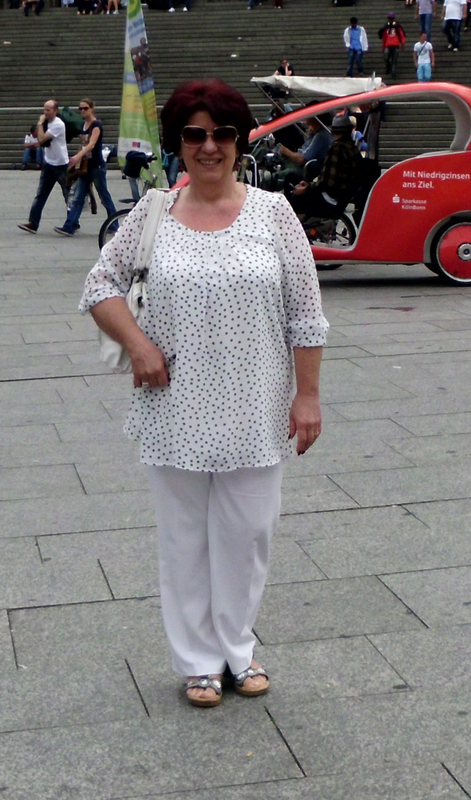 My blood values are excellent, my doctor is positively surprised, and people look at me in surprise when I say that I will be 55 years old in a few weeks. I don't have sagging skin and can even wear my swimsuit again. Thanks for a new life! You'll probably get a lot of mail, similar to mine. But I still write because we're just happy. 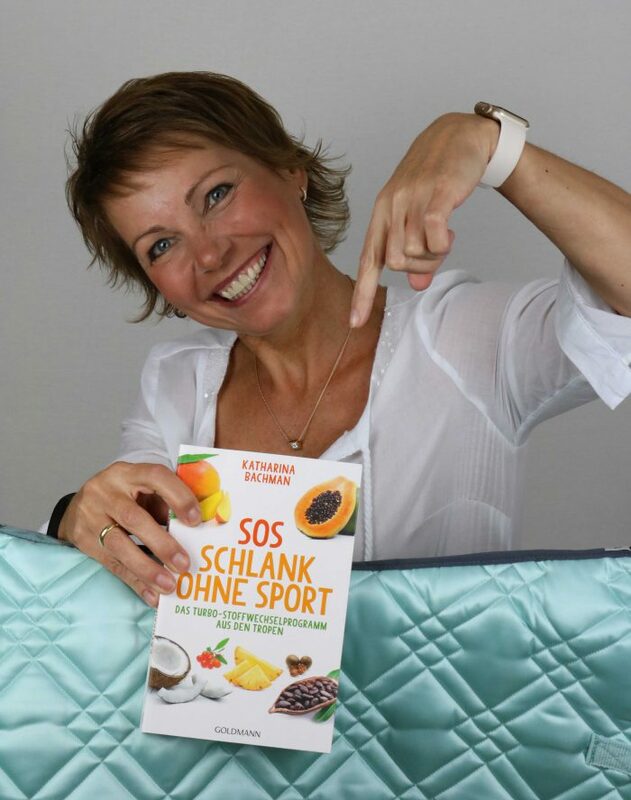 My sister (a veterinarian in Germany) sent me your book "SOS" a few weeks ago because she and her daughter have successfully lost weight using it. 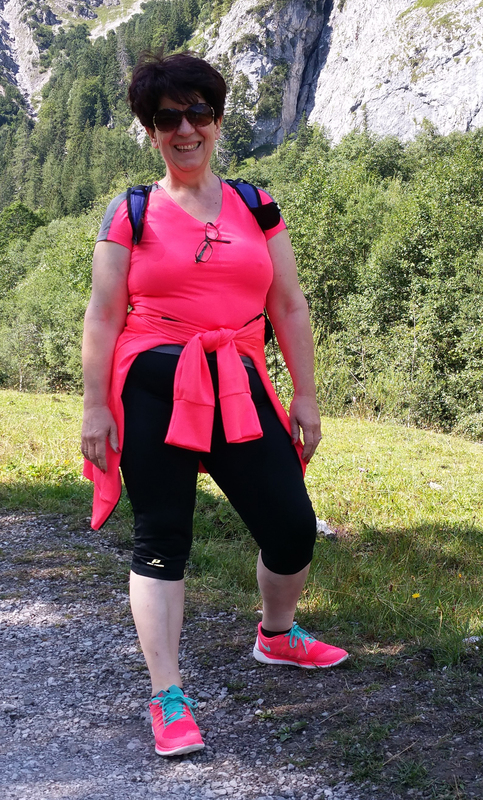 About 4 weeks ago, my husband and I started the 7-day course... and we are so successful and happy about the weight loss, that we decided to add another 7 days. 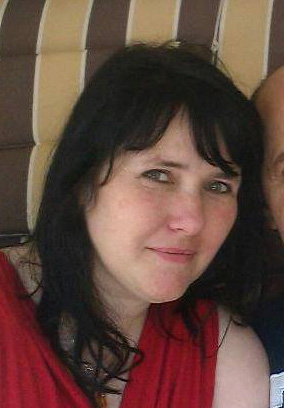 Two years ago, my husband was diagnosed with diabetes b2, hypertension, etc. 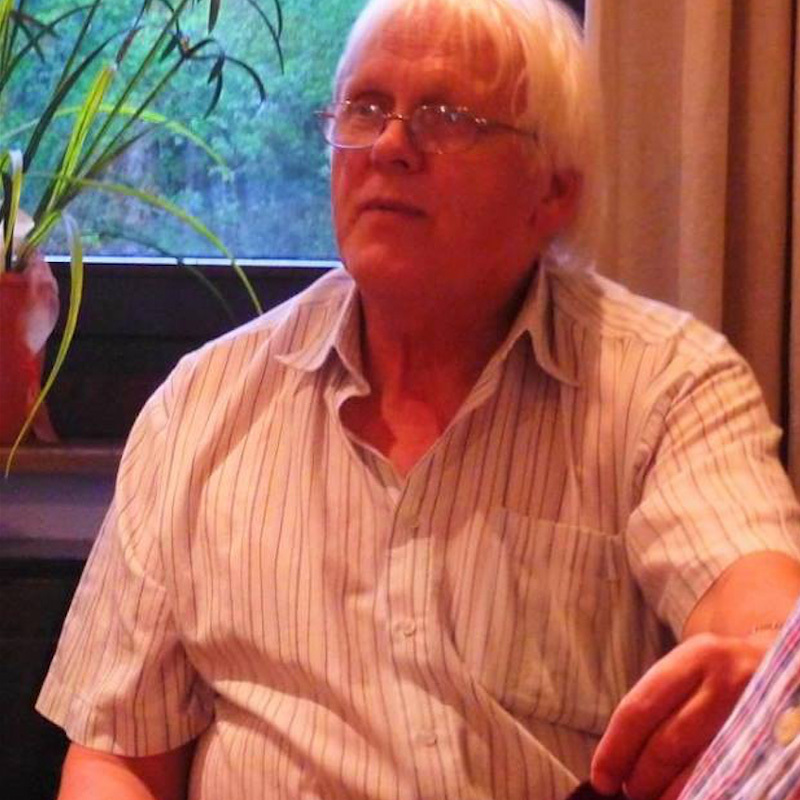 (there were many things after a "break down"), and he had to inject insulin, etc. But the values were rarely satisfactory! Blood pressure was well controlled. In the second week of the SOS course, my husband noticed that the sugar level was in a "normal range." At first, we thought it was just an exception, but no! It remained at a good level that he had only dreamed of!! 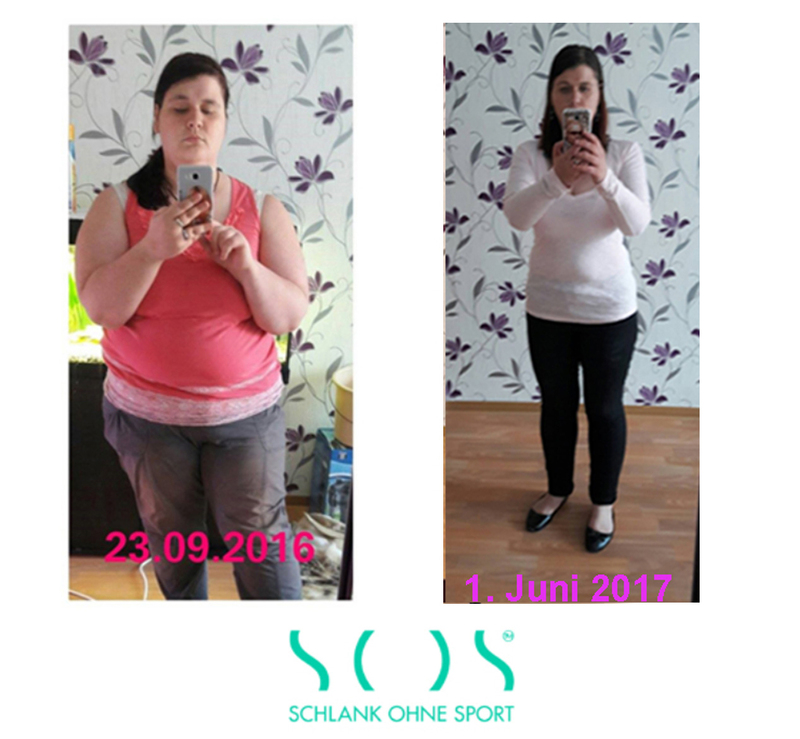 We are now in our 3rd SOS-week, in between we have eaten "normal" food, low carb - and 2 days ago he went to see our doctor for "sugar checkup." The doctor could hardly believe that my husband had these values for the last 3-4 weeks and was very happy because it is usually the other way around for the patients. He suggested stopping taking the insulin (injection) so that my husband would only need to take a pill. We are both pleased with this development and just wanted to thank you for what "your" course has done for us. By the way, we are both 65 years old (status: 2015) and were opera singers in Europe and have been living in Norfolk, VA, USA, my husband's hometown, where he now works as a "realtor." I am so happy right now that I immediately have to write you my success story. 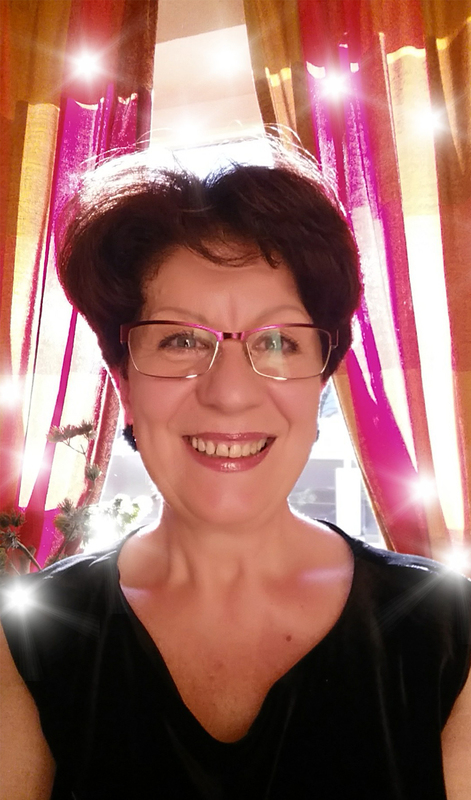 I have just received the latest results of my last blood test, and what should I say... All values, and especially the liver values that have been elevated for more than 20 years, are great! And they are not just a little better, all values are centered in the middle. I am so happy! You wouldn’t believe all the things I have done in the past 20 years to find out about the unexplained bad liver values. All the examinations that could be done were carried out, and these were associated with both terrible pain (inflammation of the pancreas after 2 ERCP) and high risk (laparoscopy and tissue sample of the liver. They were able to rule out hepatitis through countless blood tests, but... Continue reading here! 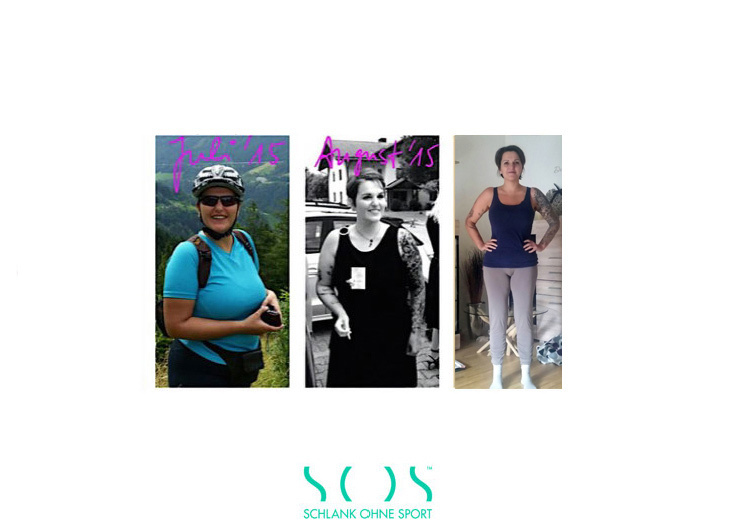 After several and often aborted attempts to somehow restrain my body mass, which has grown to 109.1 kg, I bought the book »SOS - Schlank ohne Sport« and read it with great interest. On 10/06/15, I started with a three-week detoxification phase in which I hardly felt the urge to plunder the candy cabinet. I meticulously wrote down my weight every day and am currently standing at 88 kg. Buying polo shirts in size L is much nicer than buying them in size XL or XXL. My wife has become a successful chia bread baker, and it is a lot of fun to try the new foods and see its effects. Now I have had my suits sewn tighter, and I am wearing clothes again that would have ripped in a fitting months ago. 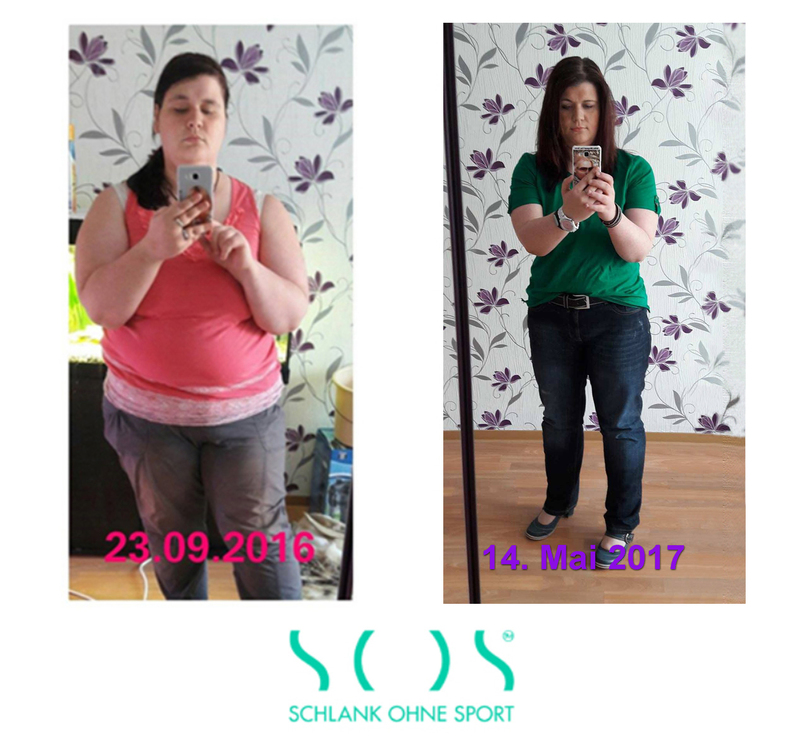 After being a silent reader in the SOS-Facebook-group for a while and having done a good job with my SOS, I want to give everyone a boost of motivation. I started last year. 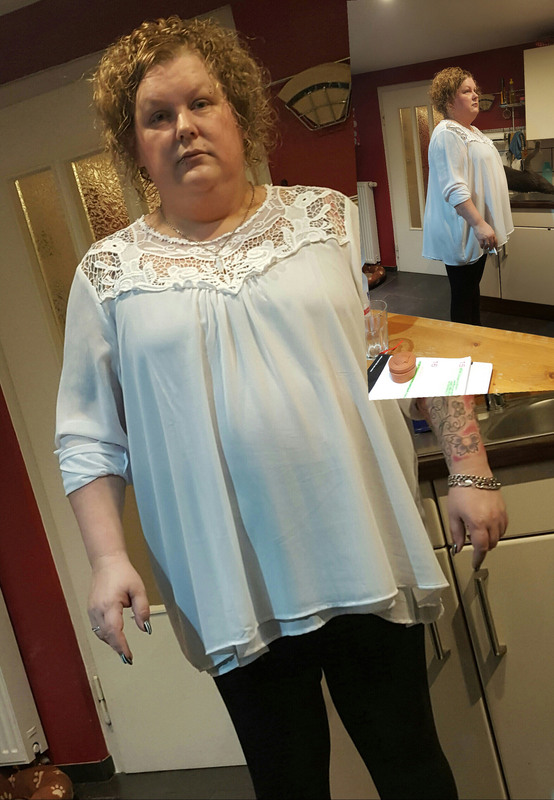 The first picture is from November 2015 with over 90 kg. 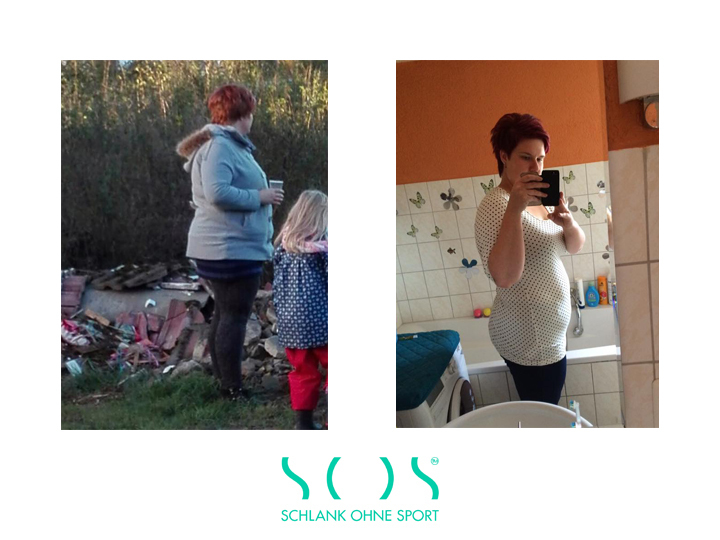 The second photo was taken in March 2016, and the last one is from today, with currently 76 kg at 1.63 m. It is going slowly and with many breaks, but it's definitely worth it! I hardly need high blood pressure medication anymore, and all blood values are excellent! I wish everyone good luck and fun and send my best regards! 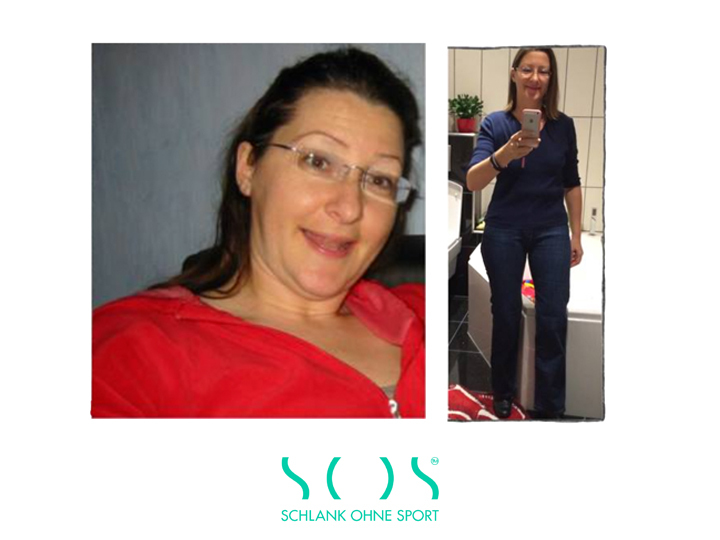 I tried to fight the kilos with countless diet attempts and sport - without success! Unfortunately, six years ago I had to take medication for several months, which had a rapid weight gain as a side effect. 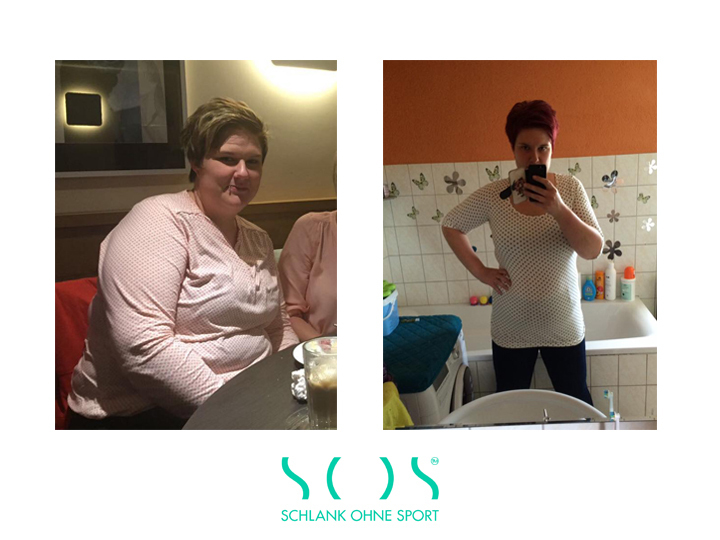 Thank God I was able to stop taking them after seven months, but what I had left was an additional seven kilograms on the scale! 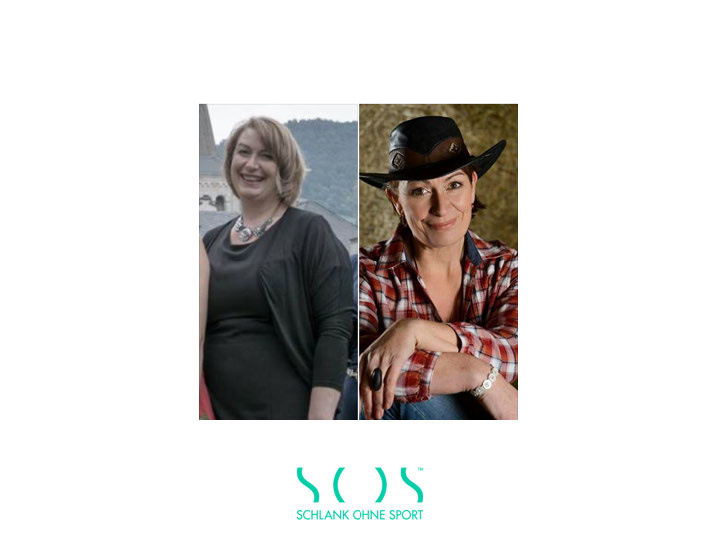 Then a colleague told me about the book »SOS - Schlank ohne Sport« by Katharina Bachman. I was instantly hooked and got the book right away. The book totally captivated me, and I couldn't wait to start the detoxification week together with her. After we had read the book until the end, we started together on 10/07/2015... Continue reading here! 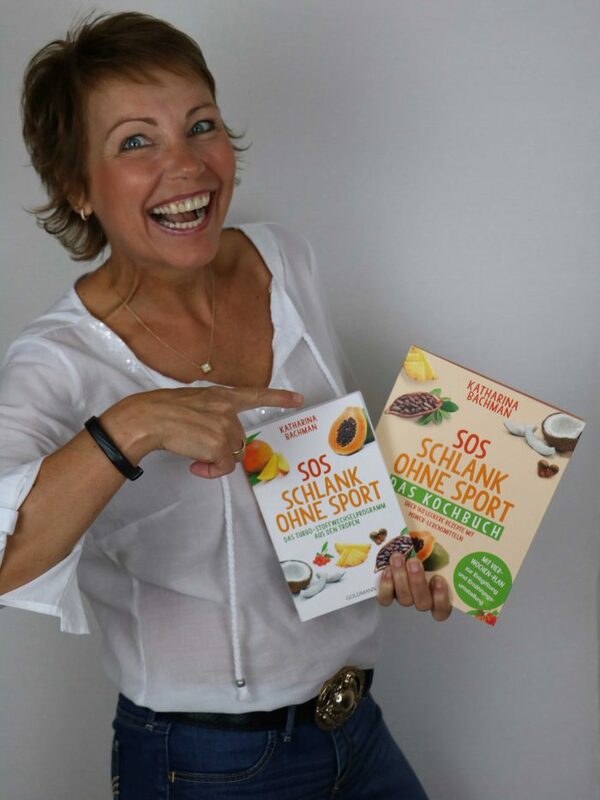 Today I finished the second detox week according to Katharina's book. 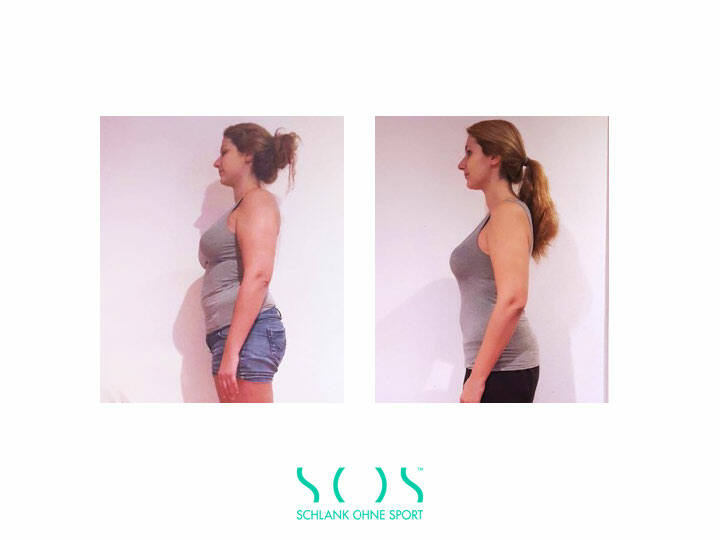 It was not difficult at all to follow the detoxification plan, even with the strictest attention to detail. 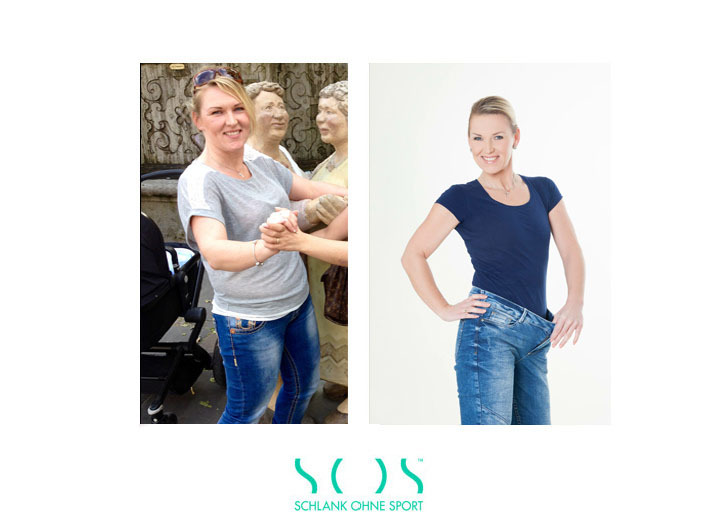 I'm so glad I happened to see the presentation of SOS Schlank ohne Sport in the ZDF Mittagsmagazin. I immediately decided to buy the book. 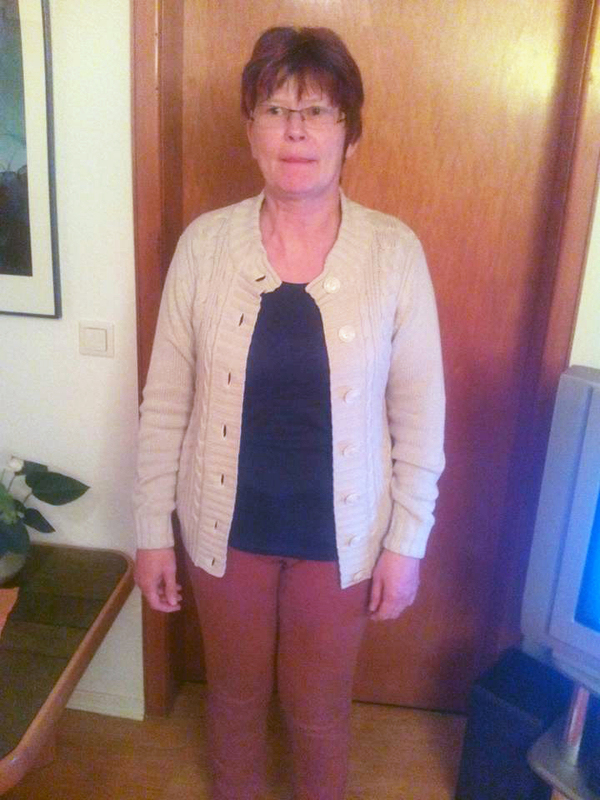 The result after 4 weeks is as follows: My weight dropped from 97.8 kg to 87.0 kg. I can't believe it! But even more important is my blood pressure, most recently at 164/74, went down to 121/80. Isn't that fantastic? Anyway, my belly needs a little bit of finesse, but by now I have also lost 6 cm of my belly circumference. Katharina Bachma's book is a real blessing to me. 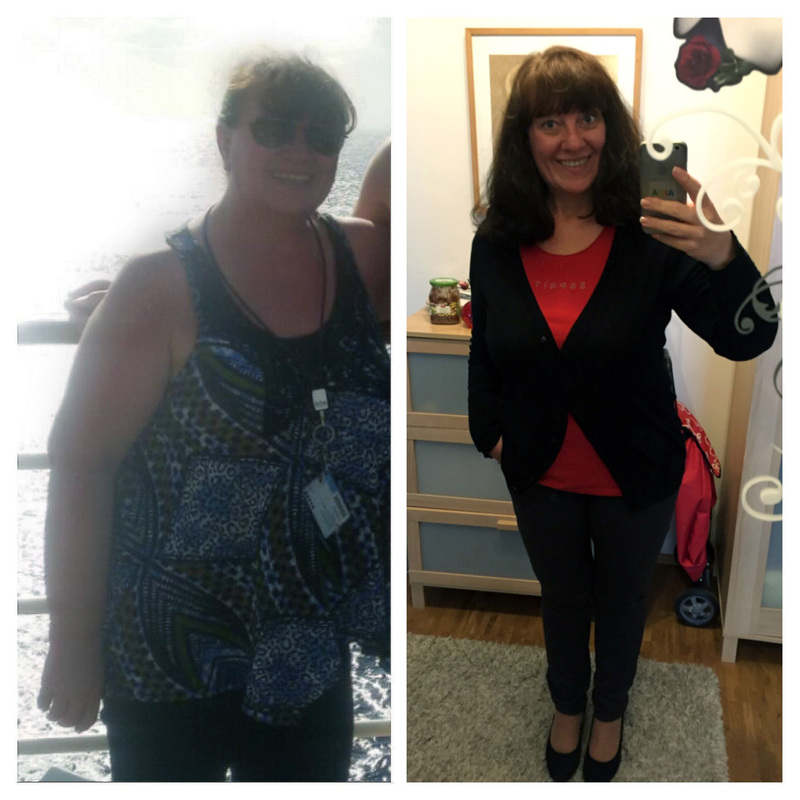 Four sizes down since the end of January 2016!!! 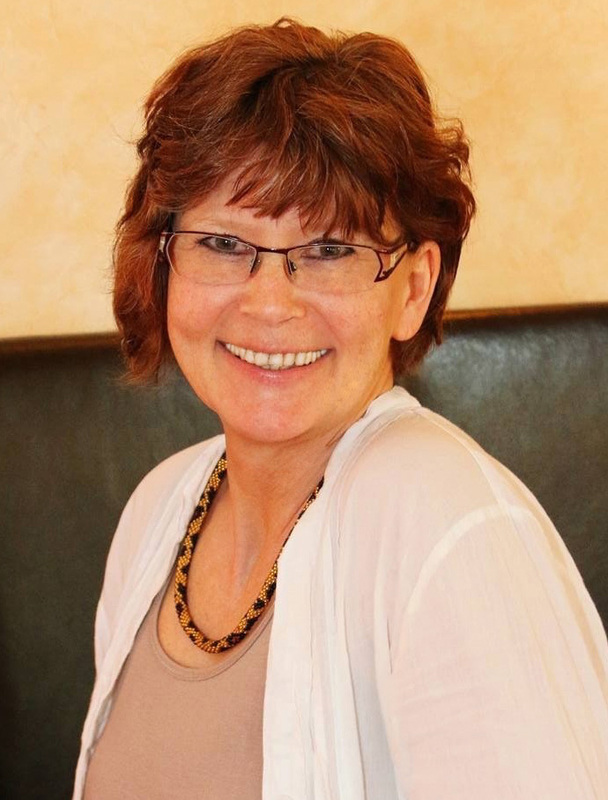 Thank you, Katharina Bachman, for bringing your books to my life at the right time! 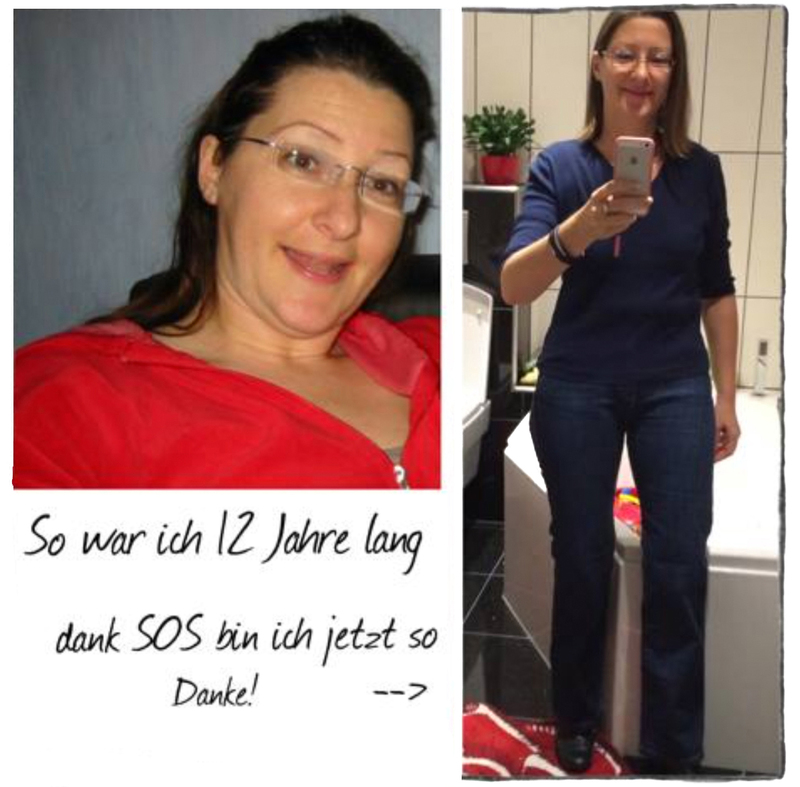 I lost 17 kilos with ease and pleasure! The book has made it clear to me that the many "nice" food intolerances, which I experienced years ago after one and a half years of vegan lifestyle, were caused by the immense amounts of soy (tofu) consumption. This has also been confirmed to me by other experts in recent months. With SOS, all the intolerances have gone, I no longer use soya and instead enjoy delicious, colorful food. Other than that, I don't feel like I'm spending a lot more money on food because I'm leaving out other things. 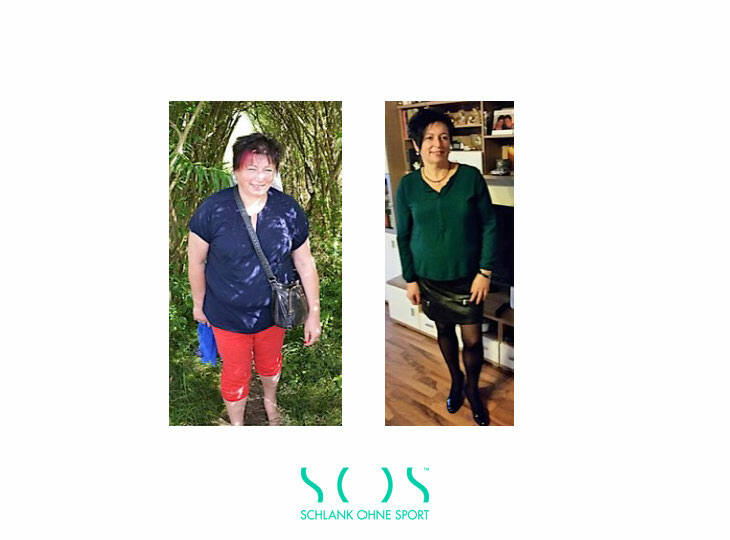 Through SOS I have found a way to get out of the eternal dietary cycle and its yo-yo effect. And I have the feeling that I have now found the right way to the ideal body - without mortification, ravenous hunger, etc. but with a lot of pleasure and fun at eating "colorful" food. 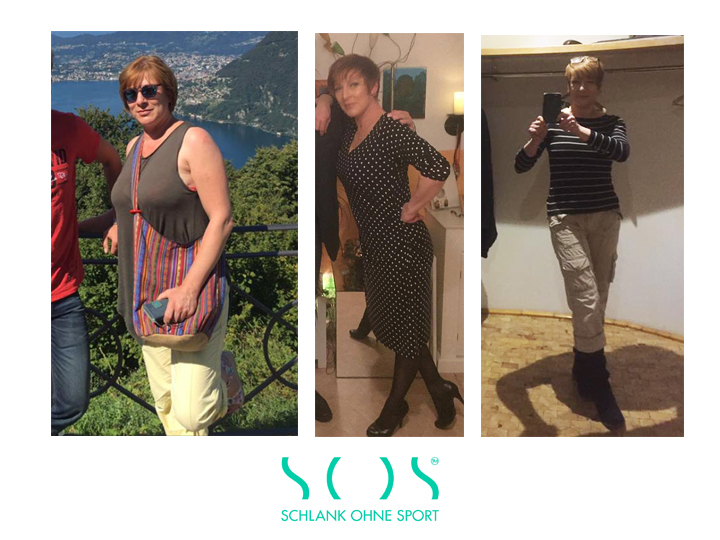 I have lost 28 kg since February 2016 (thereof 13 kg through a metabolic diet in the first 4 weeks). 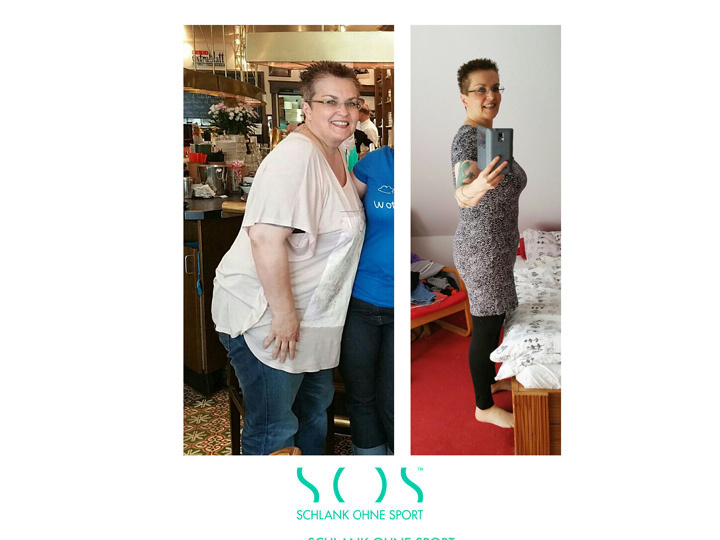 I have been eating SOS-compliant food since mid-March and have lost another 15 kg. My doctor is deeply impressed, and I showed him the SOS book, more or less as my new Bible. 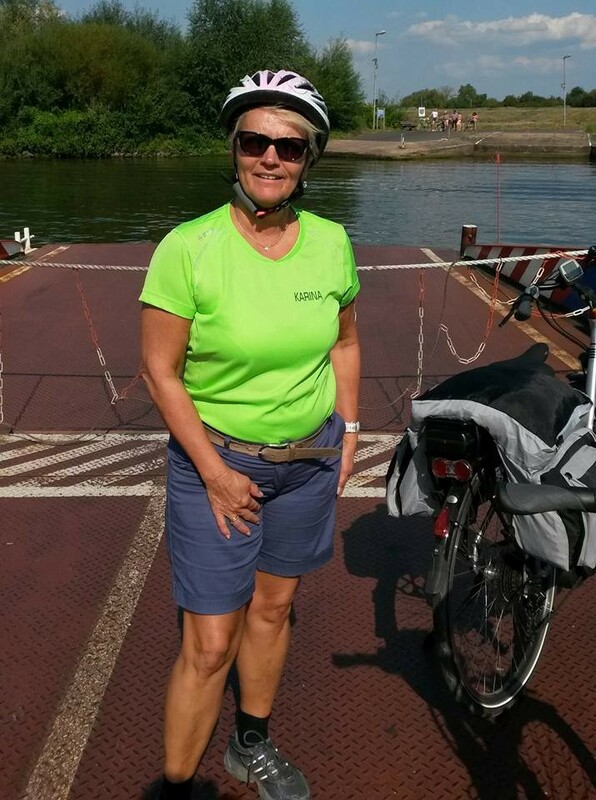 Thank you, dear Katharina, for sharing your story with us all. It was a good deed. Now I'm in my fifth week of detoxification. I'm totally committed to the program. In addition to the basic SOS book, I recently bought the cookbook with the 4-week plan. I think I'll like everything. 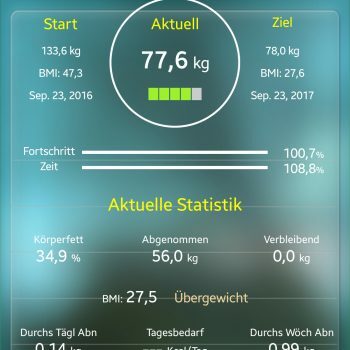 After my son was born, I still weighed 10kg more than before. 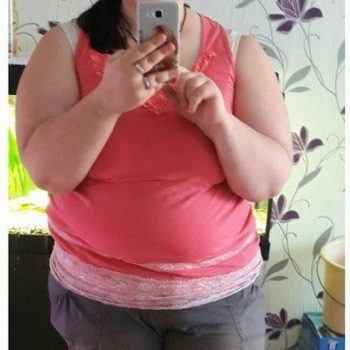 I was 20 years old and felt sooo fat weighing 65kg that I started dieting. 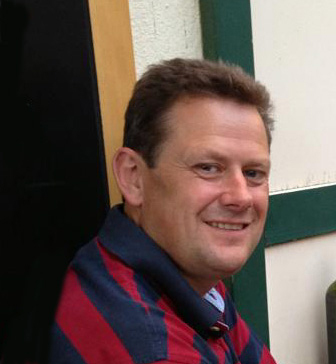 Although I tried a lot of well-known diets, I weighed over 130kg after a few years. After that, I was too scared to step on the scale anymore. And over the years I have developed all the diseases that can cause obesity - diabetes, high blood pressure and arthritis. 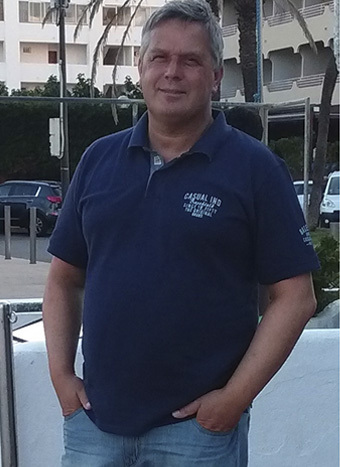 I became tired of it and began to lose more or less 10kg per year through fasting, and I was able to hold the weight (I am now 56 years old). I discovered SOS in April 2015. 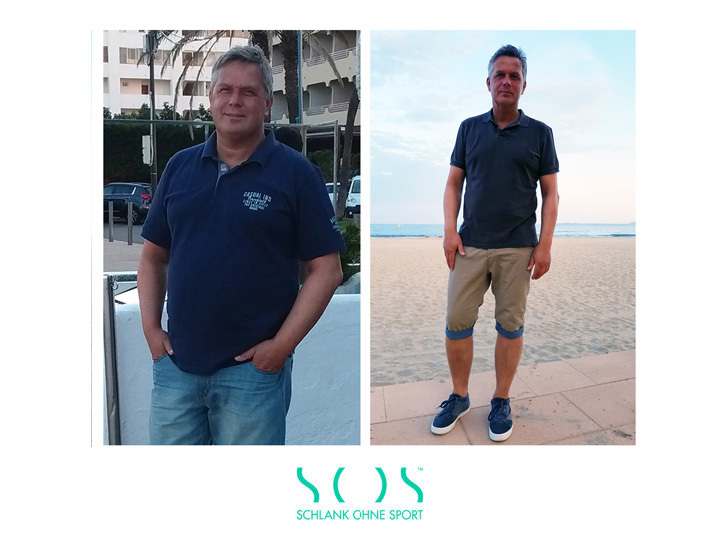 I weighed 100kg when I started to change my diet and I did not only manage to lose 20kg without starving and by eating tasty dishes, but I also managed to get rid of the diabetes, high blood pressure and arthritis. I am healthy again, I feel good, and I’ll definitely keep going. I want to lose a few more kilos. It's incredible, after years of endless attempts, my weight's been going down for a week. I even lost 800g from yesterday to today; where are they? And the best part is, I also reached my first goal. I wanted to have a 7 as the first digit of my weight. It wasn't easy, but with SOS I changed tack. Many thanks to Katharina Bachman for all the advice. 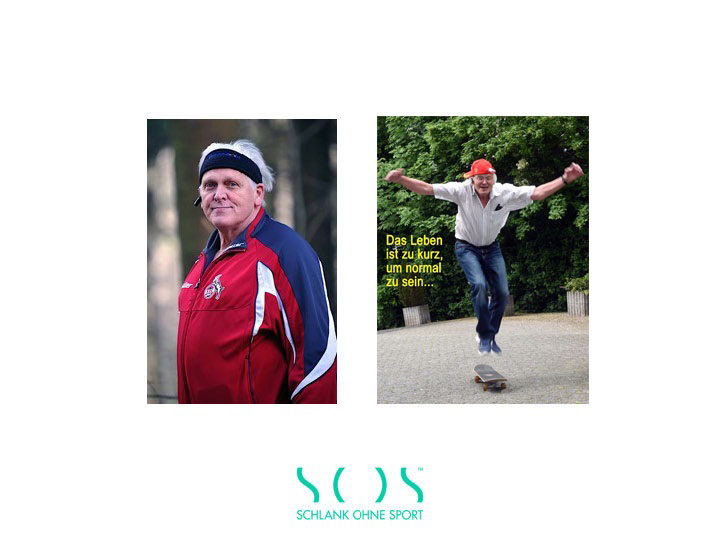 Thank you for your book »SOS - Schlank ohne Sport!«. 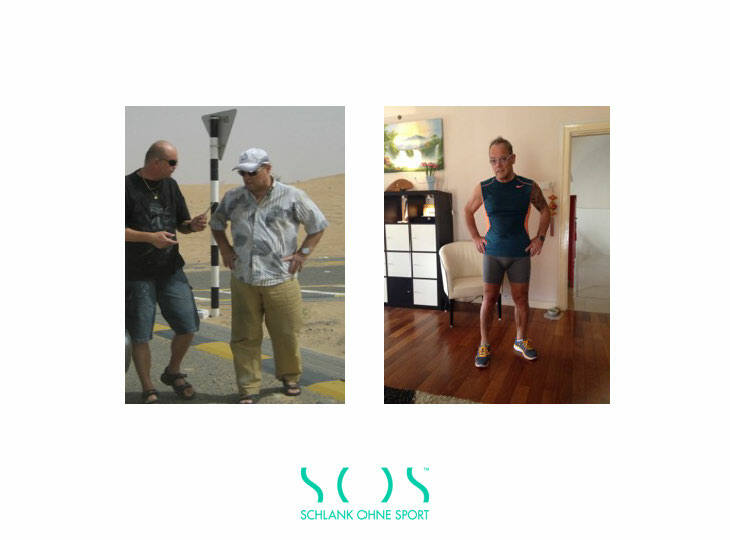 I have lost 10 kilos with the detoxification plan and the subsequent change of diet! Yes, and I feel good all around, I now weigh 62 kilos, my skin looks and feels better! I am already looking forward to your cookbook being published in January 2016. Thank you for sharing your knowledge and experience with us. I wish you good health and much fun at work. 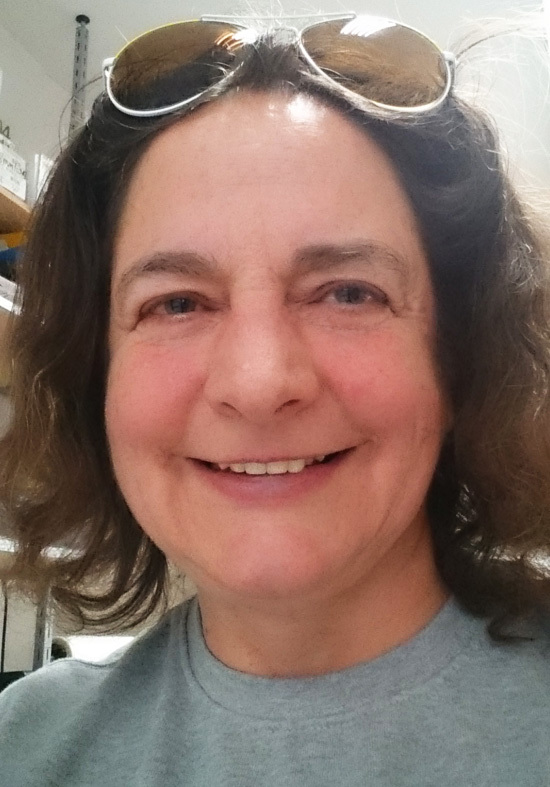 I had read about Katharina Bachman's successes in the newspaper. I was impressed and had to buy the book right away. 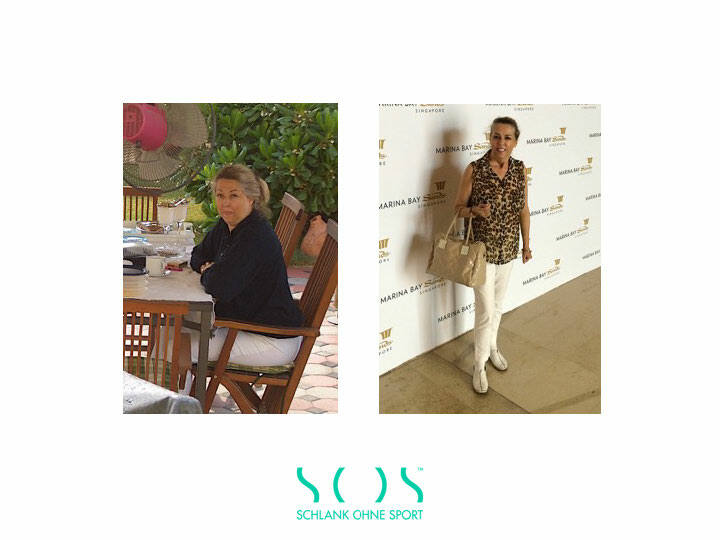 During the reading of the book I was allowed to get to know her and would like to thank her again for letting us participate in her personal experiences in the book »SOS - Schlank ohne Sport«!!!! 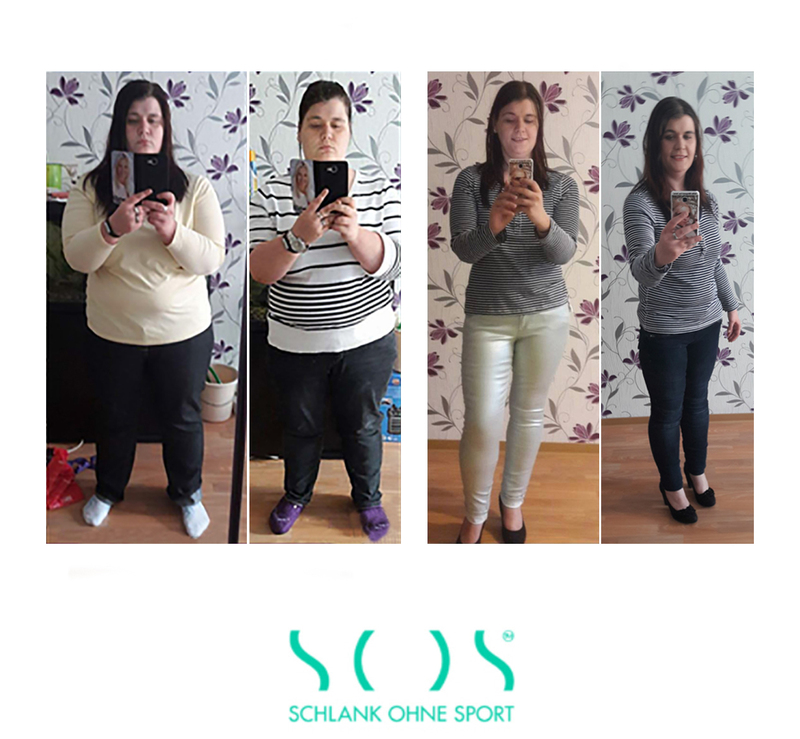 I have been successful in losing 9.3 kg of weight within 9 weeks, feel very comfortable, have a lot of energy, and done something very good to my body with the change of diet. Thank you! The SOS concept is definitely a great success. I'm doing just fine. I have now lost 12 kg. 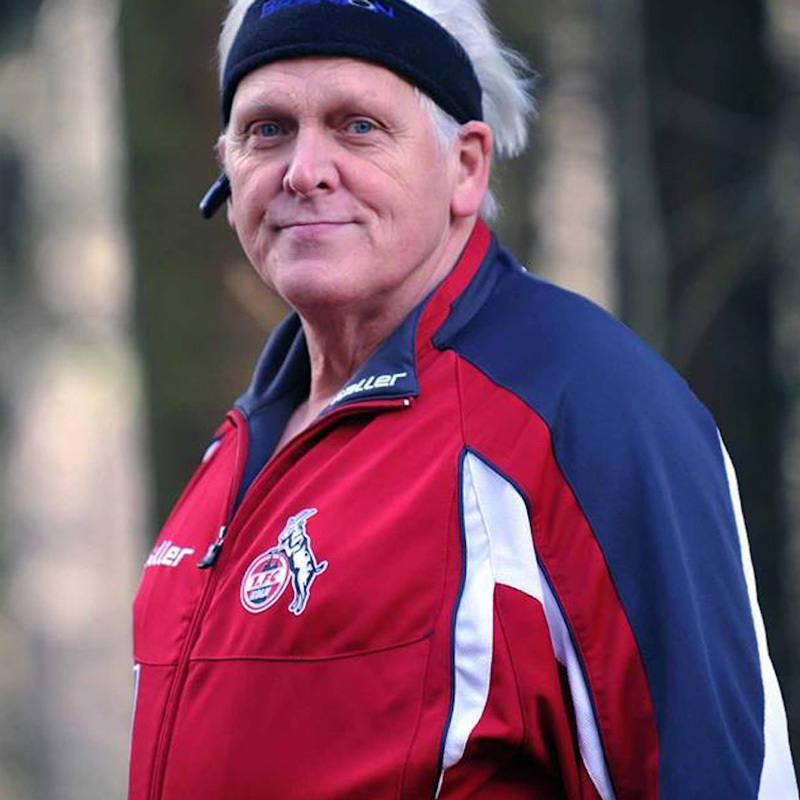 But despite SOS, I do a lot of sport. This has also changed my body proportions in a positive way. 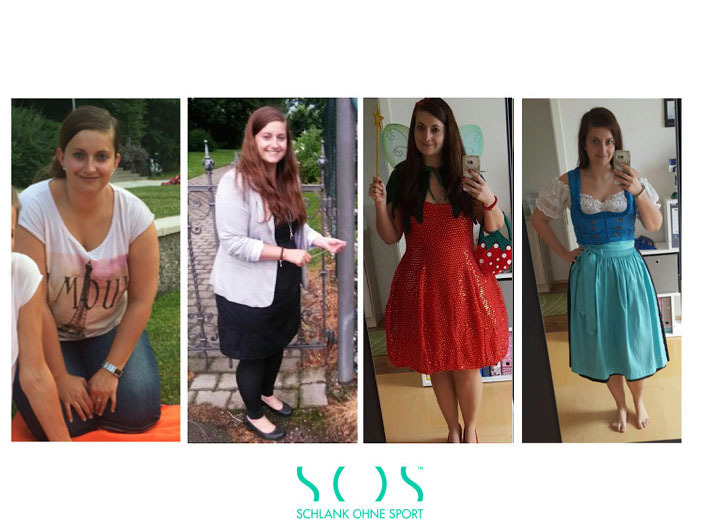 With SOS, I have managed to lose 20 kg and I still eat according to the concept. 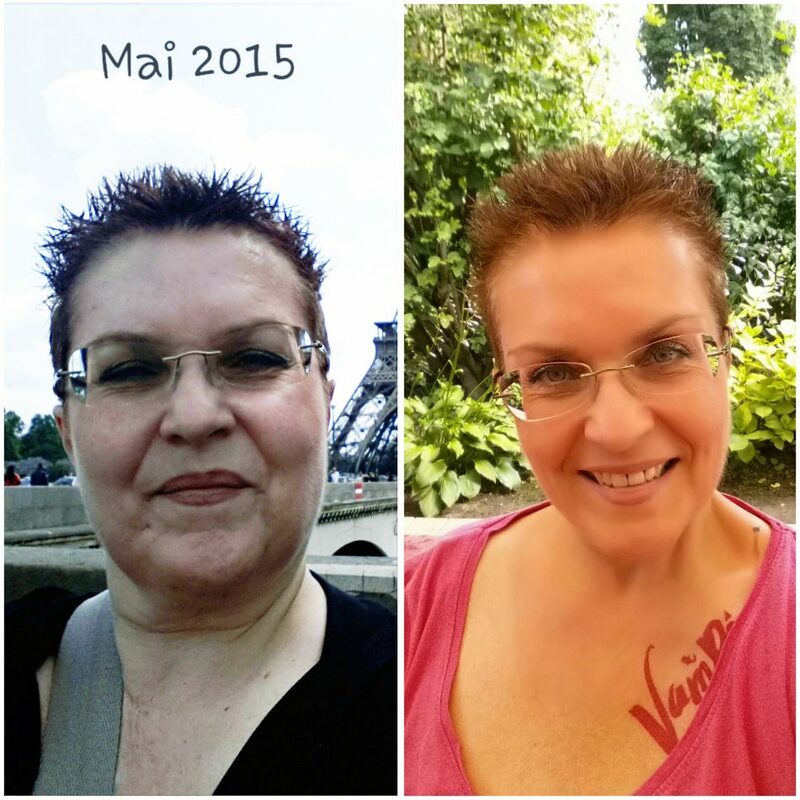 It was the best thing that has happened to me in many years of different diet experiences. I don't see it as a diet, but rather a great form of nutrition that can be enjoyed permanently. 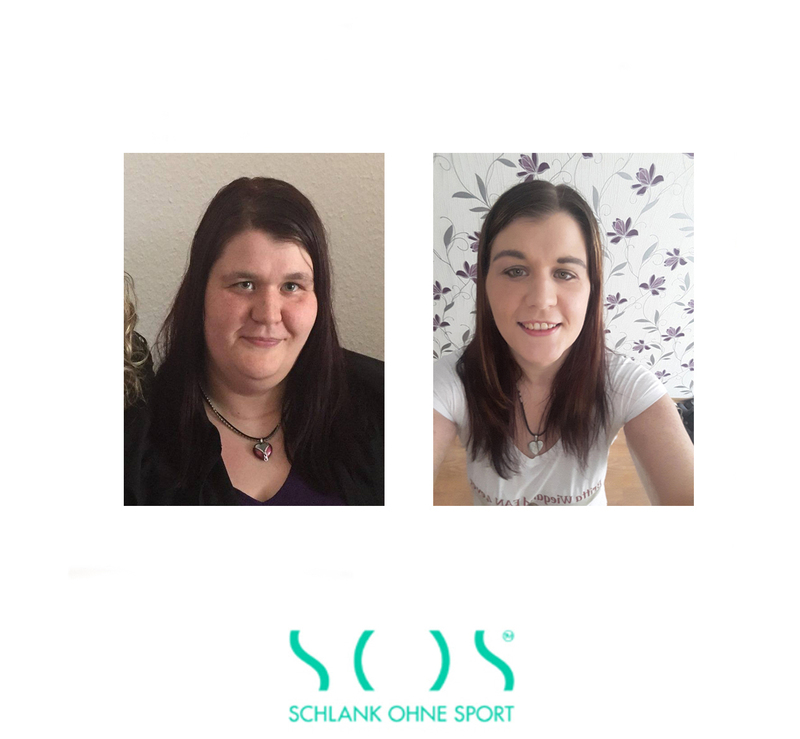 I am so happy and grateful to have regained my quality of life with SOS and Katharina's experiences. 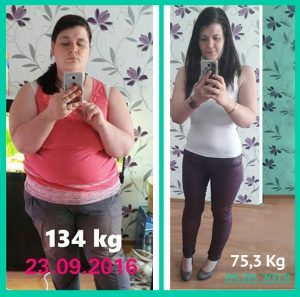 I changed my diet with the program and found the right way for me. My body shows me that it works. A year ago today I started my SOS detox week and I would like to report: I have been skinny all my life. However, I have gained a few kilos within the past few years, and I was quite helpless. »Normal« diets regularly resulted in the opposite. 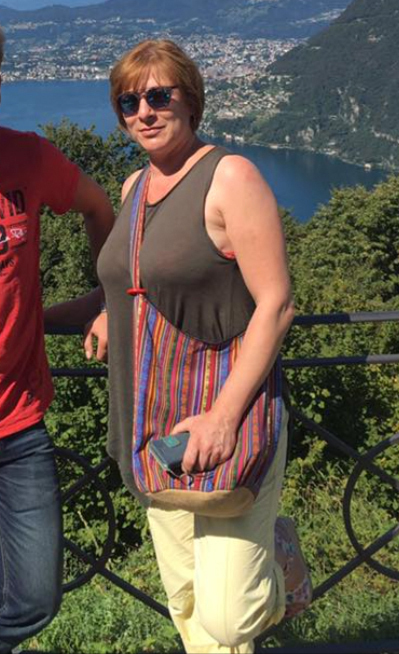 2 kilos down, 3 kilos up. 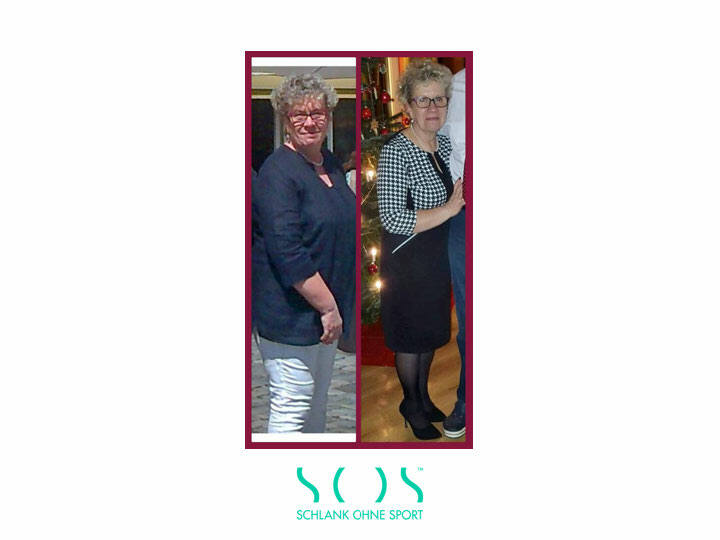 Then – being against diets - was convinced by Katharina's book and I started with the secret wish to lose 5 kg (I found this quite presumptuous). 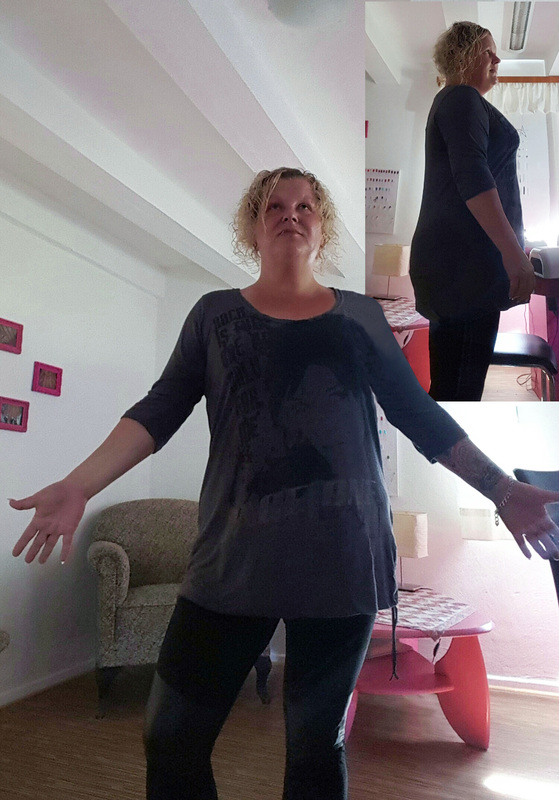 I lost 3.8 kilos during the detoxification week (I was thrilled) and lost another 11 kilos during the next 14 weeks of the nutritional change (I was amazed). My metabolism seems to have remained stable even in times when I wasn't able to eat according to the SOS diet and a few days of sinning. I didn’t “lose” anything that year. On the contrary, I have gained so much. Today I jump through life with 15 kilos less (and it’s much easier to jump). I got to know many healthy, tasty foods, which I didn’t know before. It feels great.